Marting Roberts from the telly. 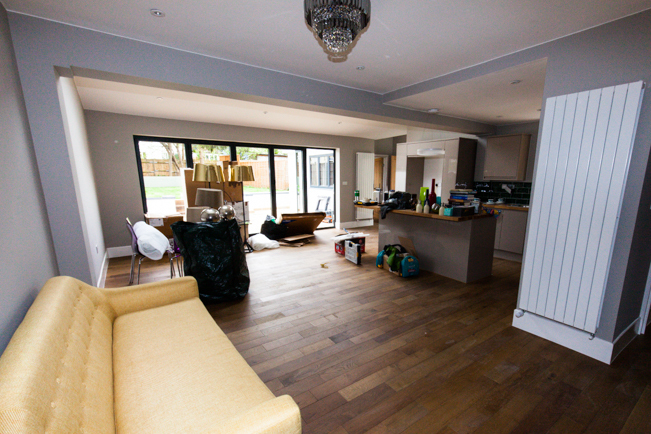 It has been a long and slow process but finally we are finished. 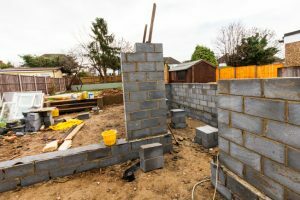 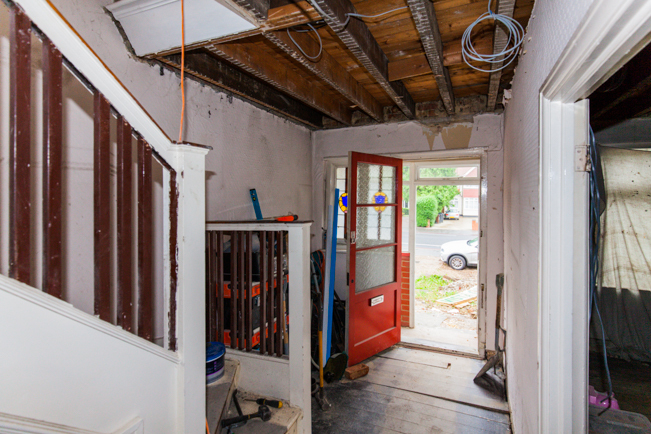 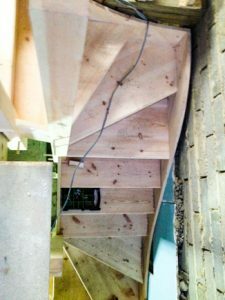 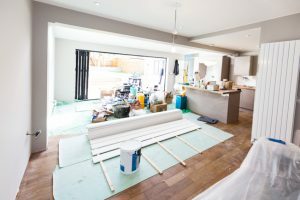 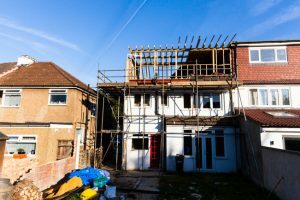 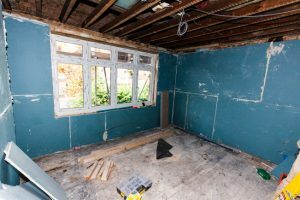 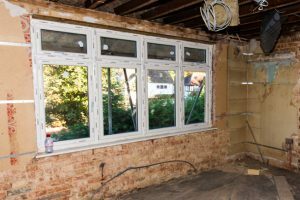 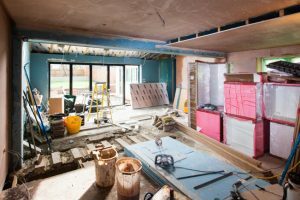 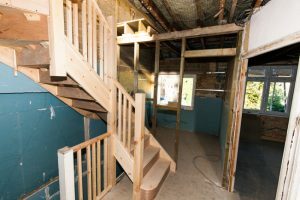 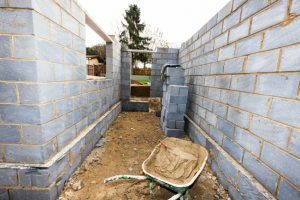 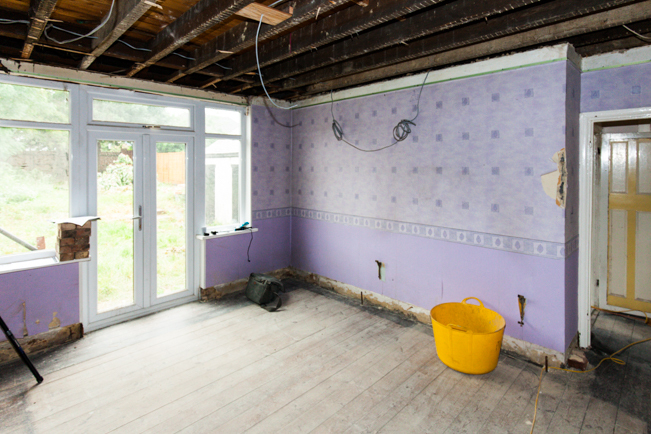 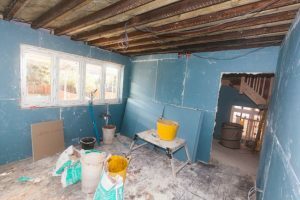 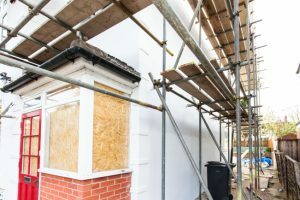 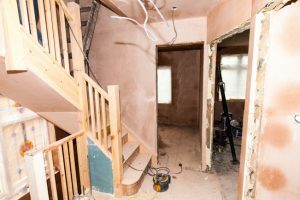 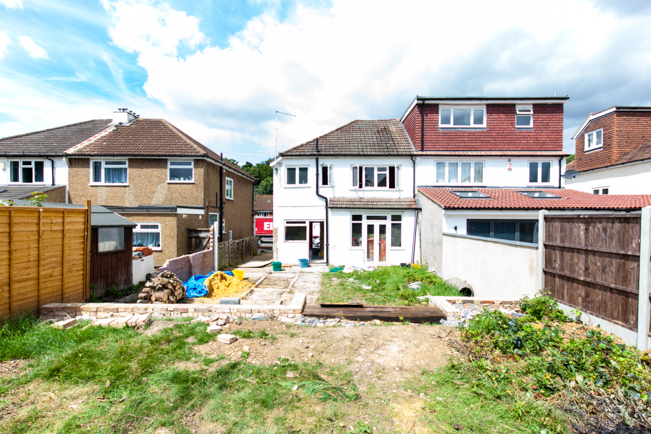 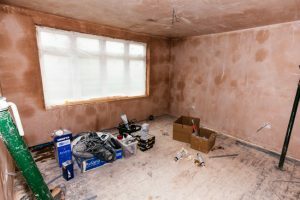 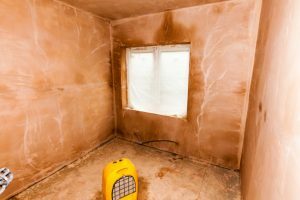 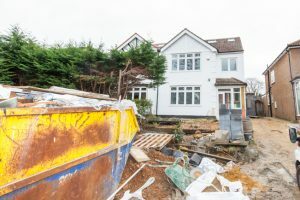 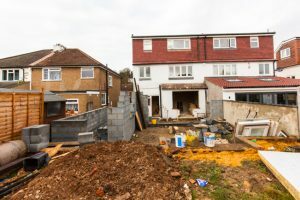 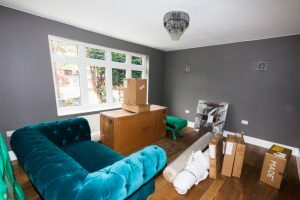 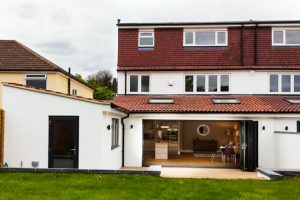 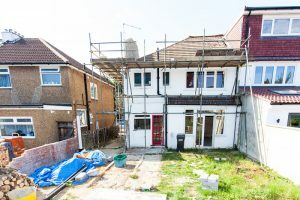 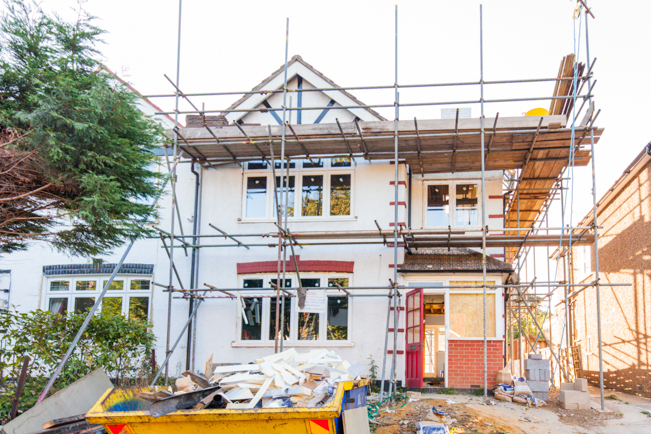 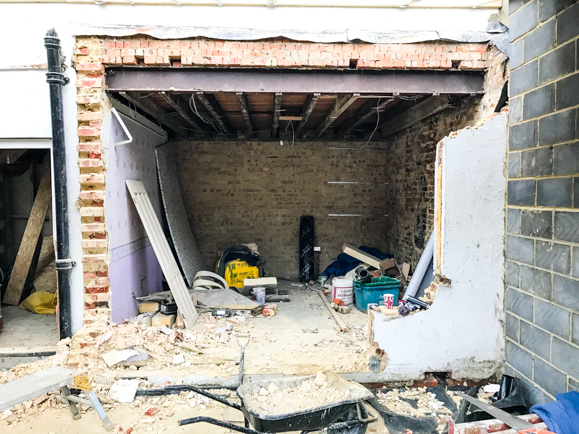 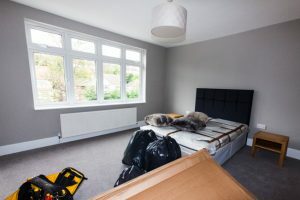 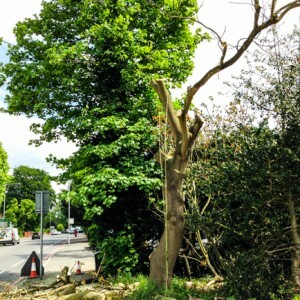 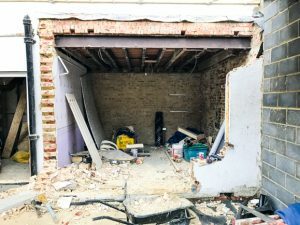 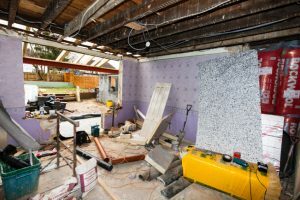 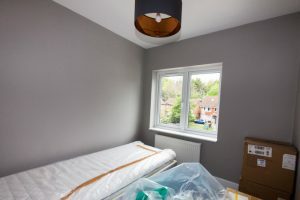 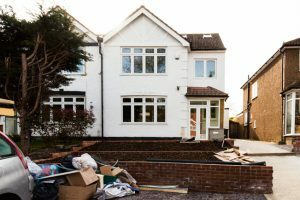 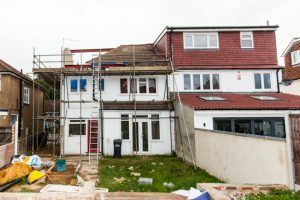 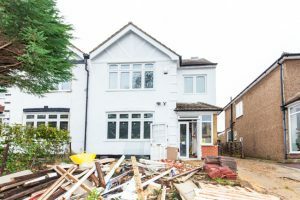 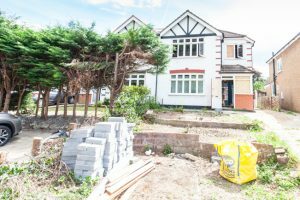 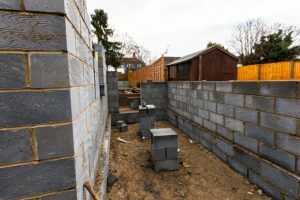 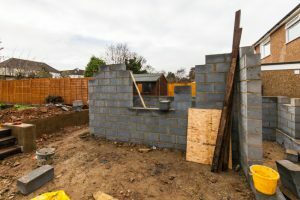 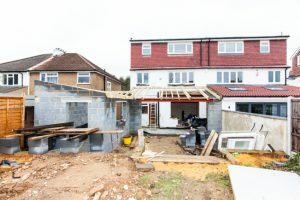 In many way we have never seen of got out of 1st gear, the delay with planning approval and its appeal and then the delay and hassle we had with the builders doing the structure for us. Fortunately though my main guys Piotr and Wojciech worked really hard day in day out and finished the house to an amazing standard that I am delighted with and I hope the new owners are as pleased as I am. 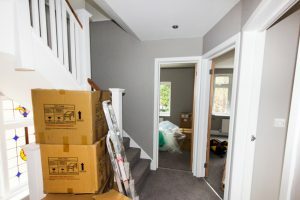 Firmly into the final hurdle now, just finishing off the final few snagging issues and we have now moved all of our dressing furniture into the property. 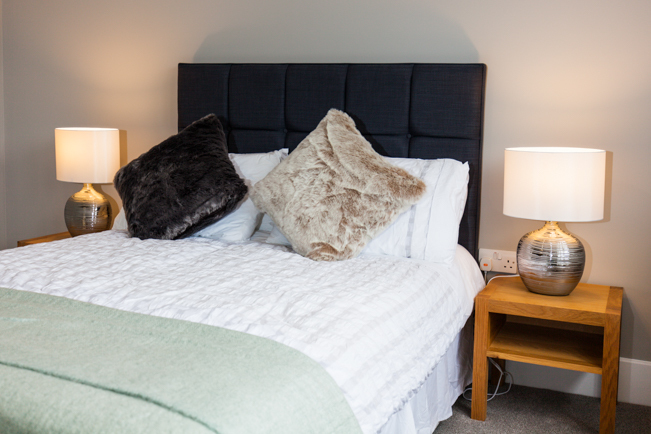 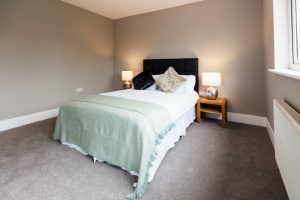 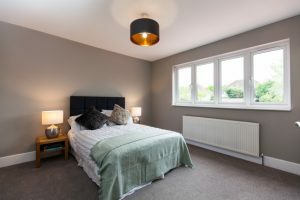 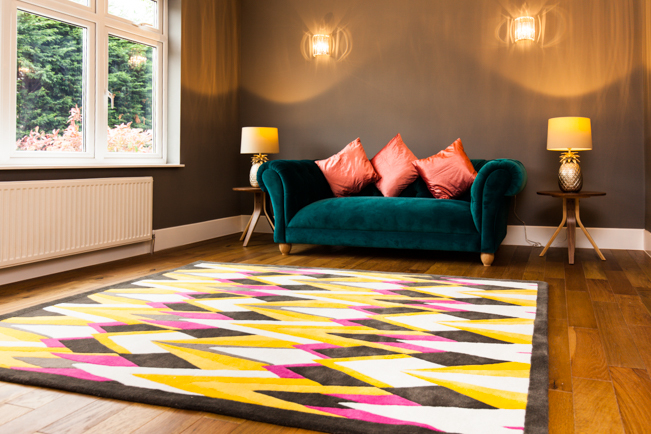 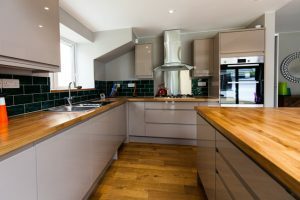 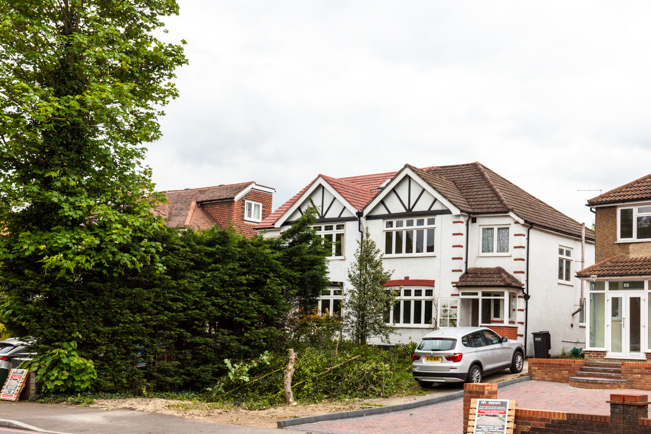 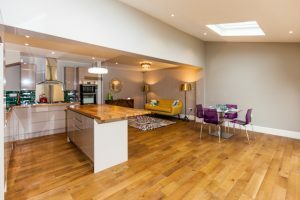 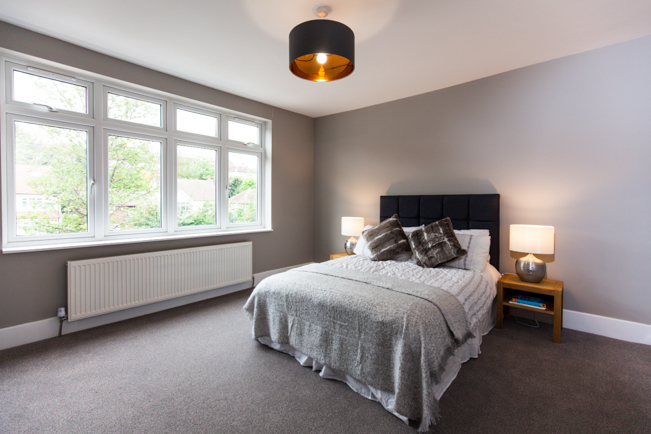 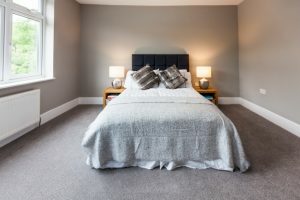 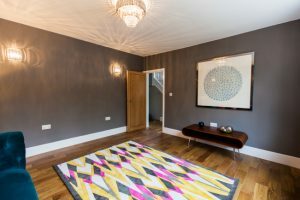 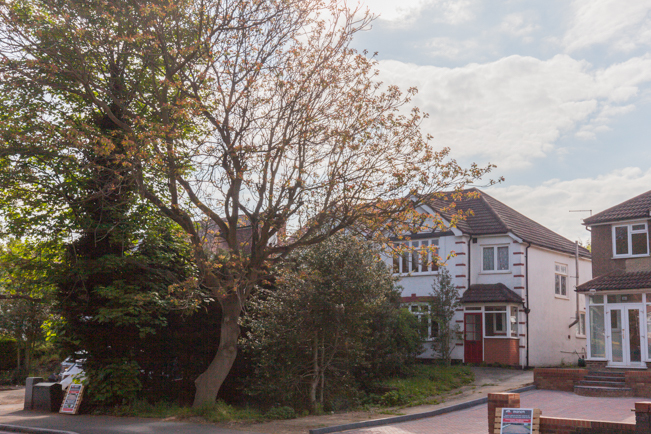 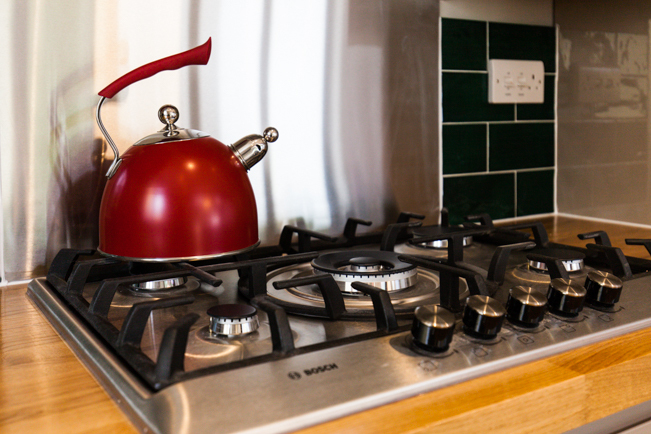 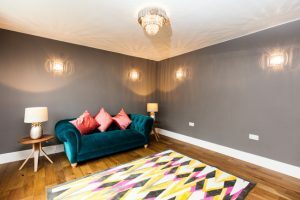 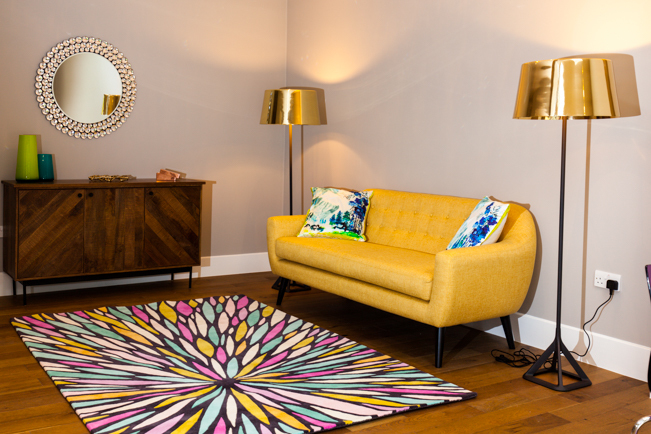 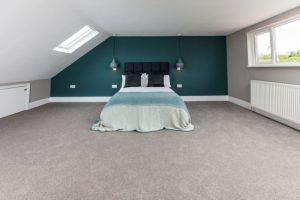 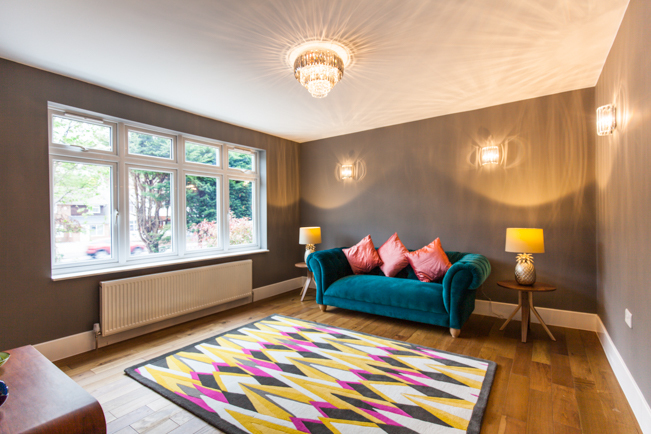 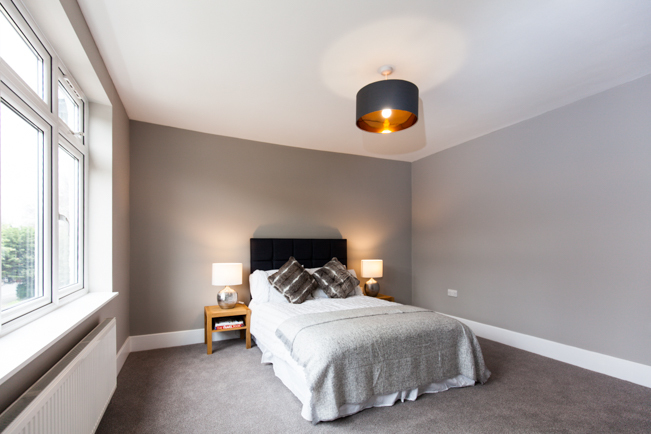 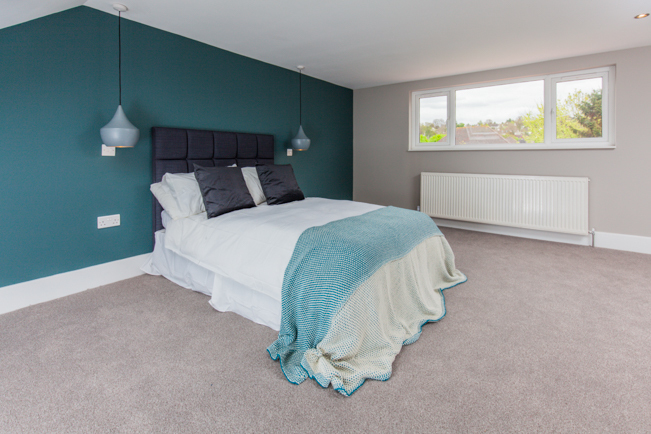 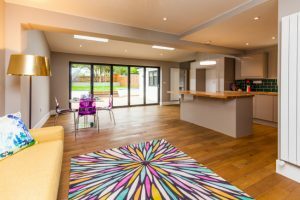 We like to dress the house as it shows it at its absolute best and gives prospective buyers a clear view of the size of the property and an aspirational lifestyle for living there. 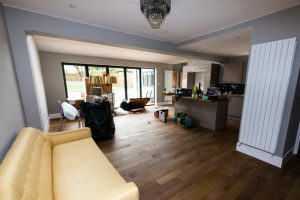 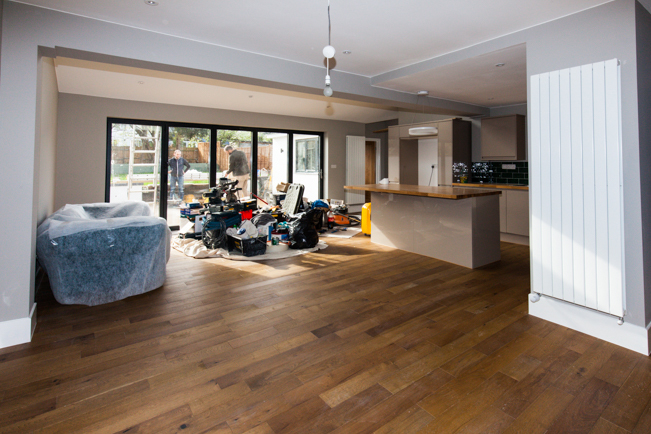 The carpets are all in and the engineered wood floor is done, the kitchen is complete and just a little bit of finish off to be done, mainly patting up the out side. 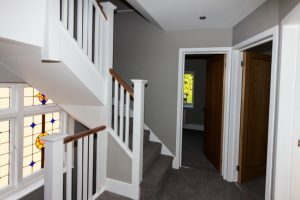 The house is looking really great, and I know we are not quite there yet but really pleased with that we’ve done and the great home, made for living, we’ve created for some lucky family. 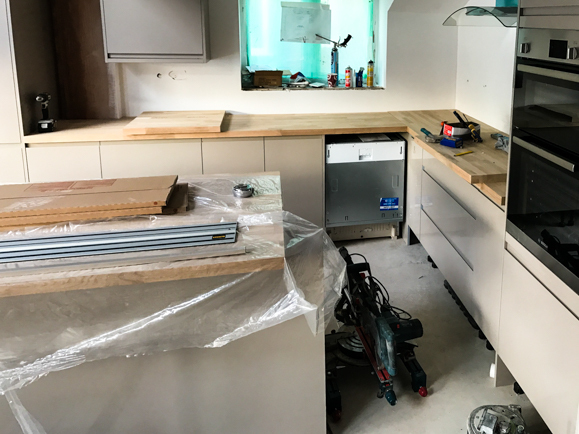 All the action in the rear reception and kitchen over the last couple of weeks, the kitchen is now fitted. 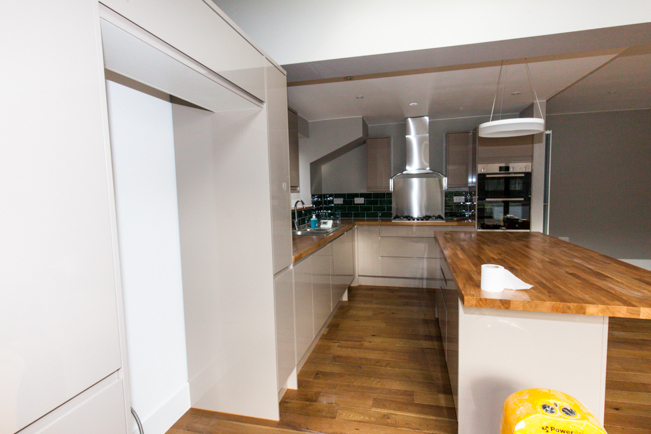 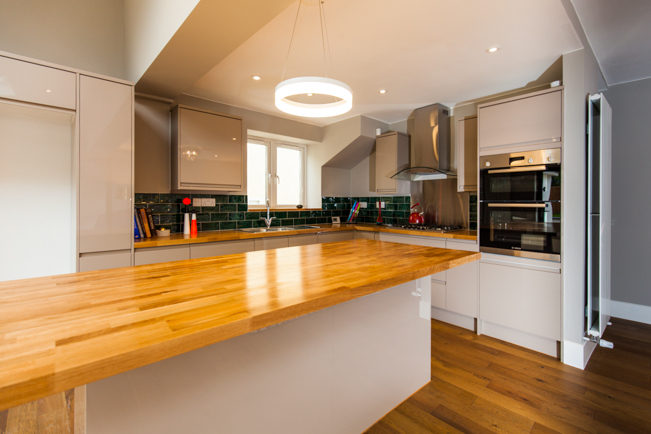 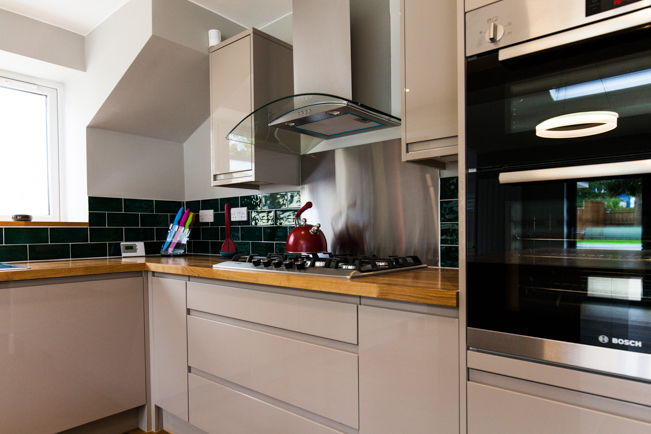 We’ve gone for a high gloss stone for the cupboards this time just for a bit of a change from our usual white. 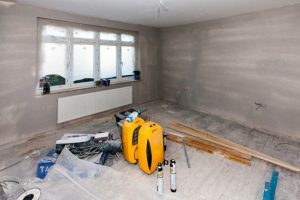 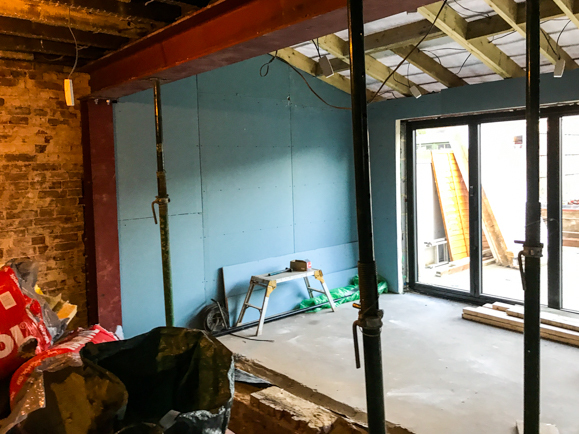 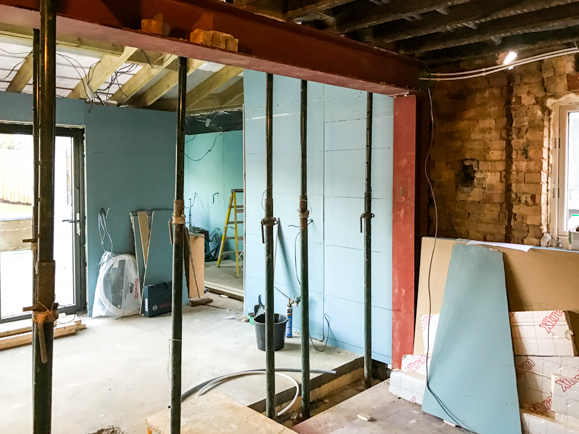 The reception, extension and utility room areas near completion, we’ve skimmed and painted the walls and laid a 18mm structural engineered floor throughout the ground floor. 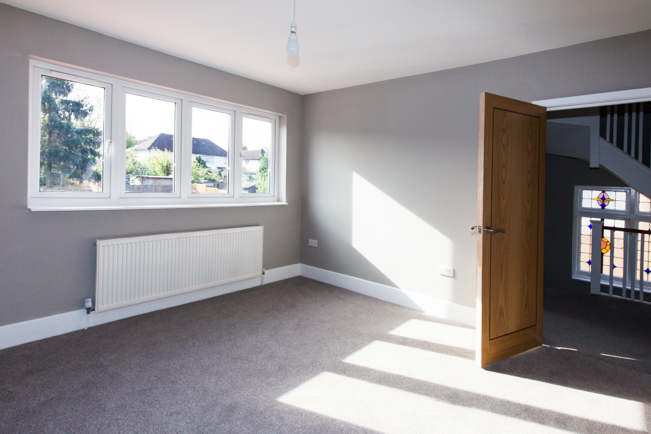 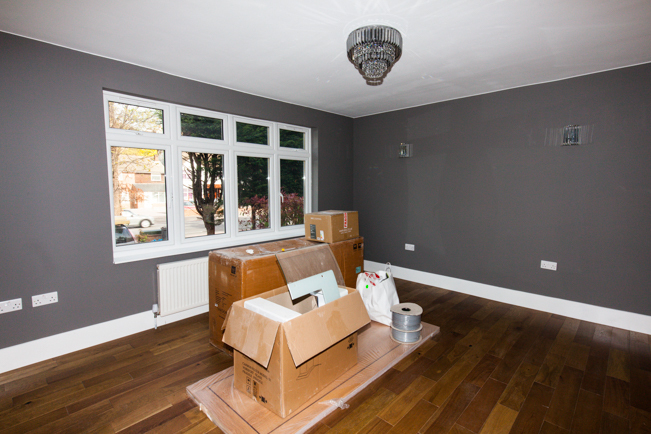 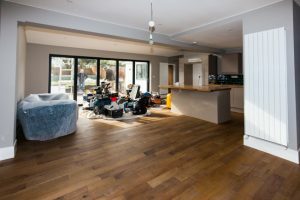 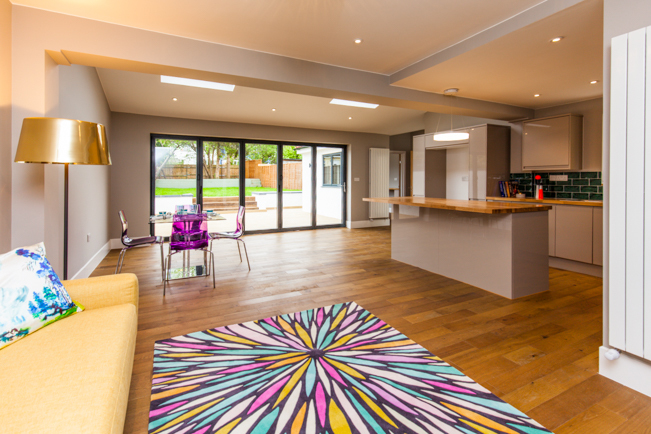 Whilst that flooring is far from cheap is gives such a great finish it show the house off to its absolute maximum potential. At the front of the house we’ve completed the front driveway, opting for plum slate chippings. 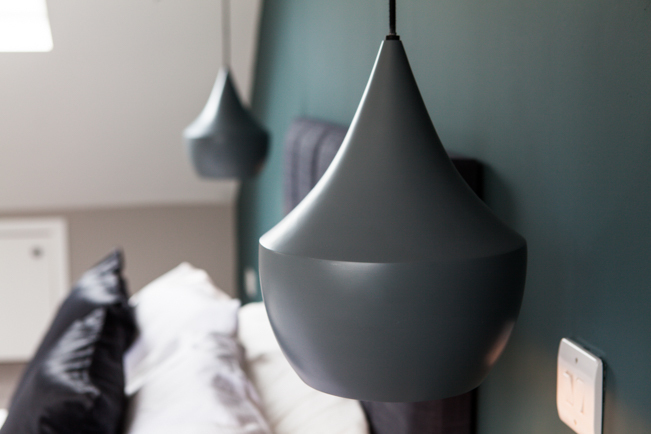 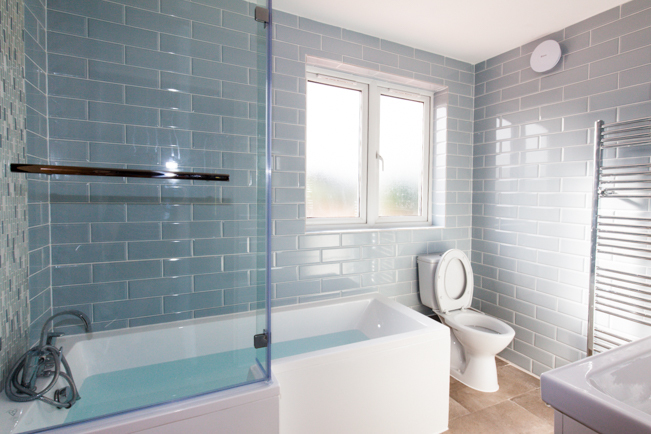 Not only do these look great but it creates a porous surface which keeps building control happy. 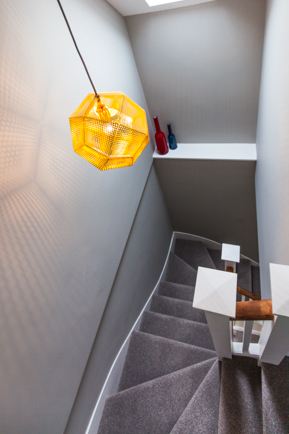 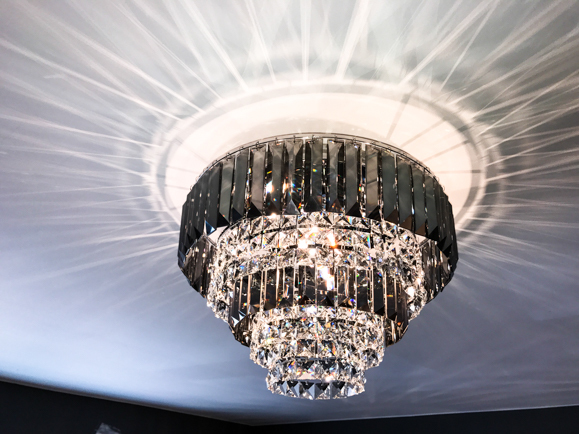 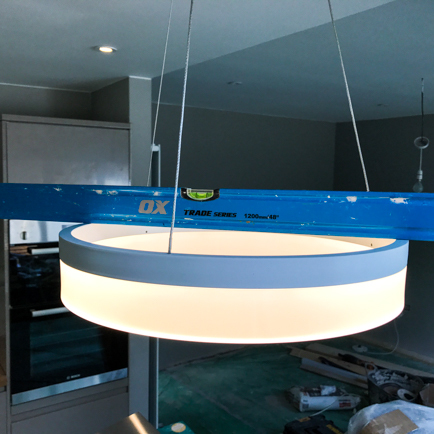 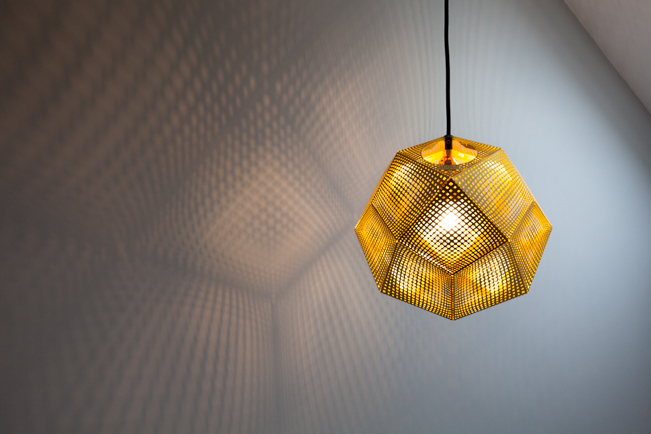 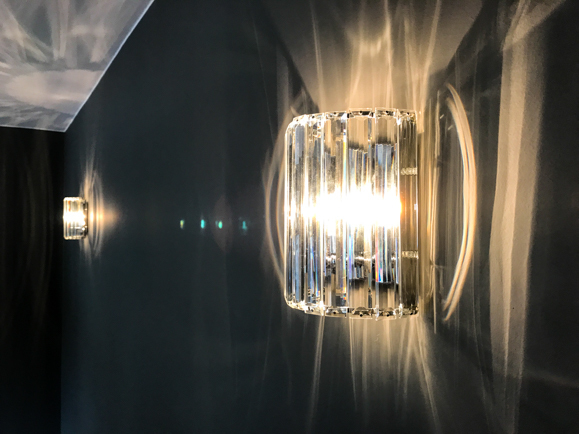 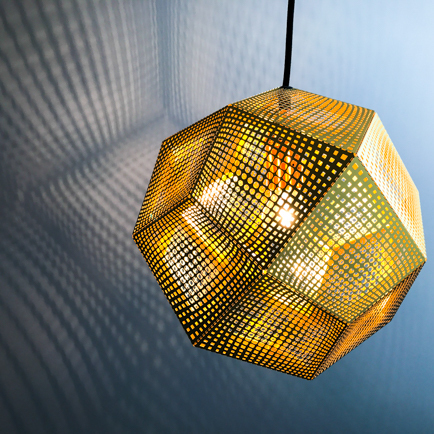 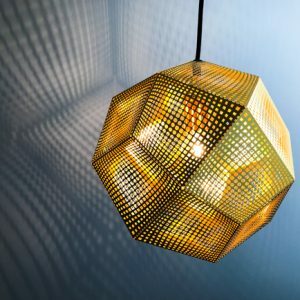 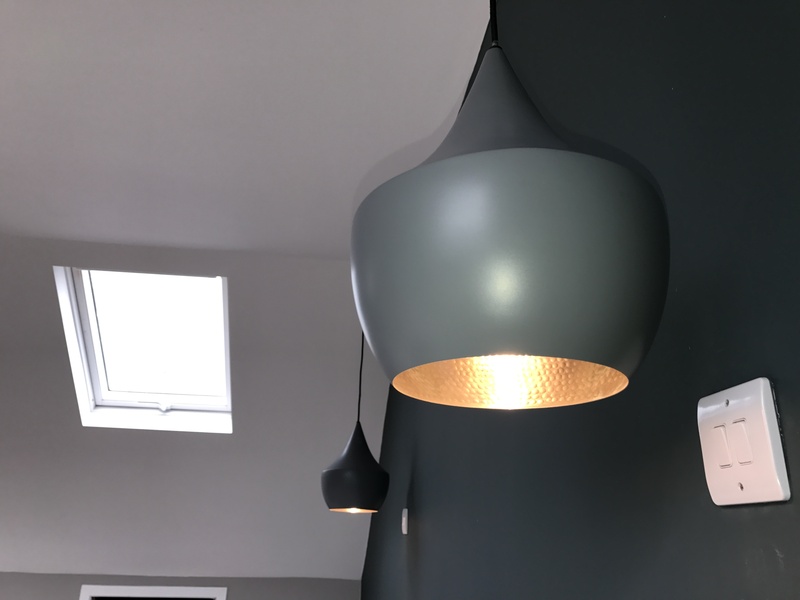 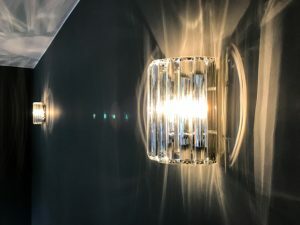 We’ve also been busy finishing the electrics by fitting all the ‘fancy’ light fittings, my especial favourites here are the Tom Dixon Etch light in the upper stair well, the patterns it projects makes for a stunning feature. 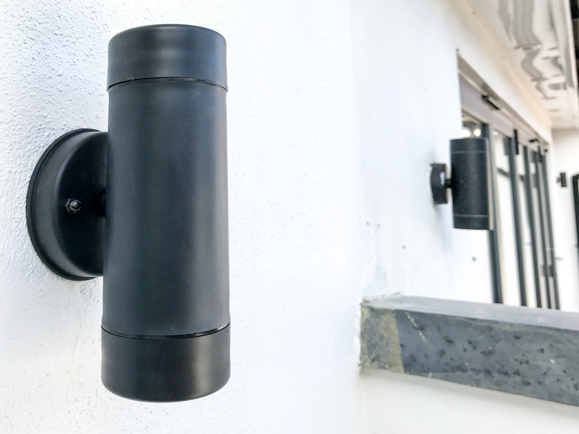 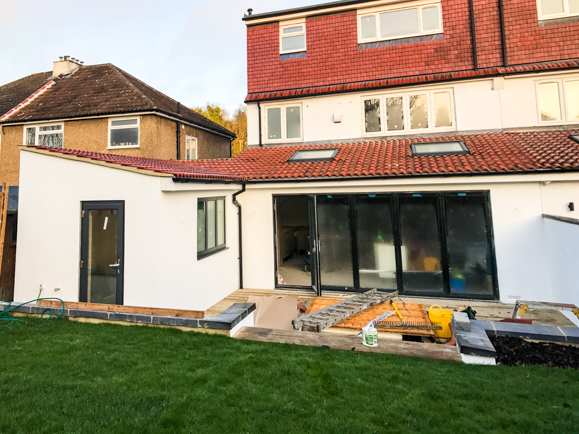 The outside lights have also been fitted, you’ll notice here that I’ve tried to match the neighbour’s lights to create a continuous and cohesive space between the two houses. 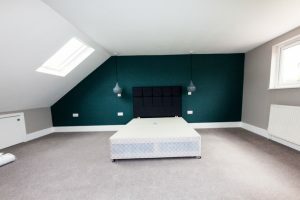 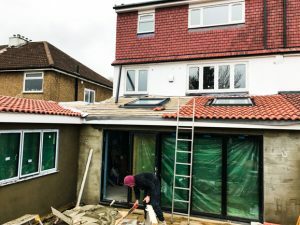 The roof has finally been completed, it should of been finished at the beginning of the year even or even at the end of last but the builders working on the structural part of the extension simply stopped coming to site and it took some big arguments to get them to do what they were paid to do. 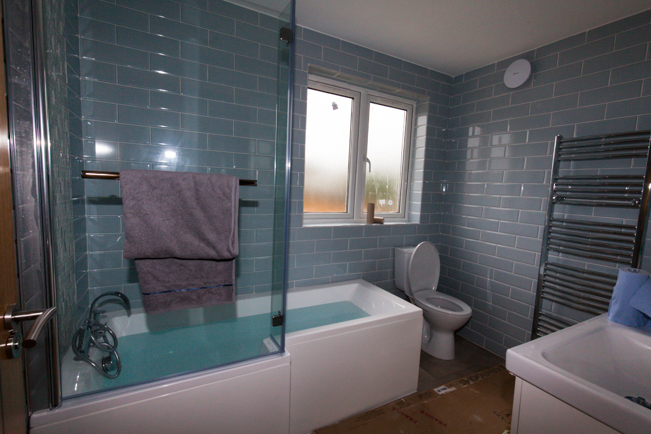 However it is done now, although we’ve got to replace some broken tiles that they don’t seem to care about. 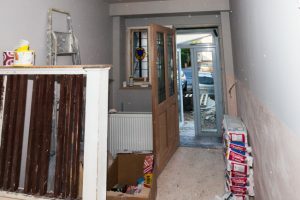 It is sad that despite the amount I have paid them and the promise of future work, they took the money and ran. 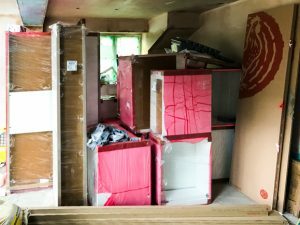 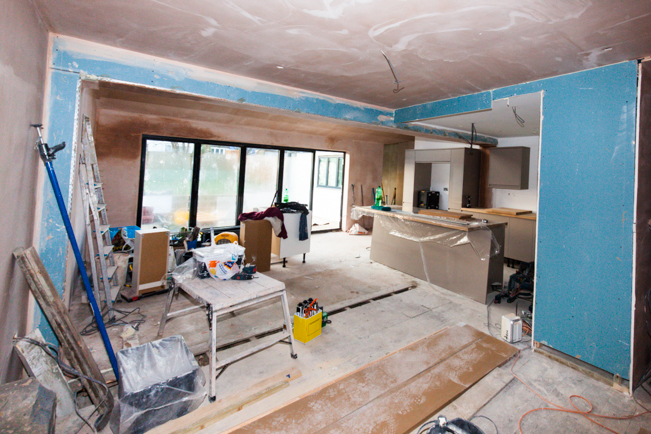 On the inside, now that we are watertight we’ve been able to plan, order and fit the kitchen. 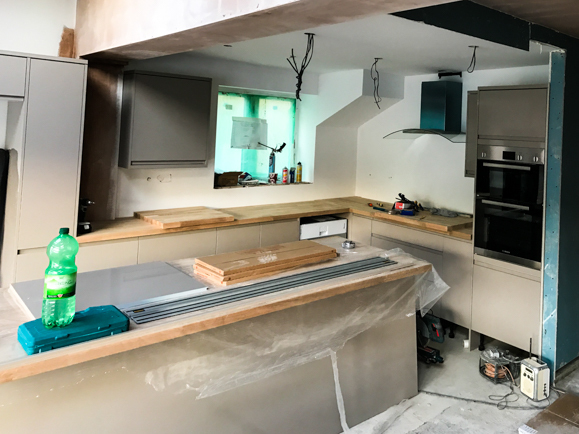 My guys working on the interior couldn’t be more different from the structural guys, guess which is Polish and which is British?! 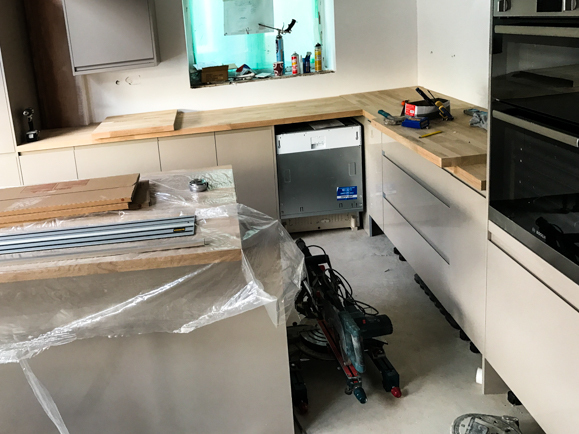 The kitchen more or less is fitted now, just a few bits left to fit and a little tiling to give it that MPC pzazz. 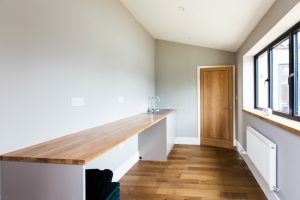 Also on the inside, the utility room was painted, Farrow and Ball Purbeck Stone. 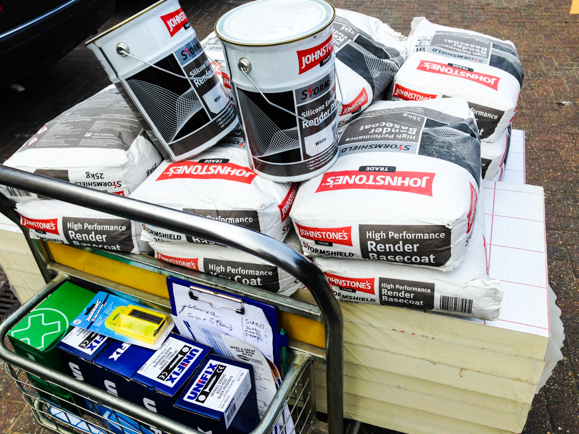 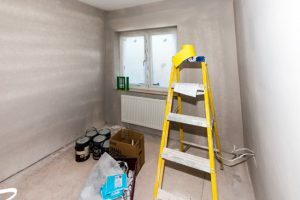 The paint is expensive but the great quality means it goes on much easier and gives a better finish, so does save you you a little in work and expence which helps balance the price for a tin. The outside lights have been fitted, the electrical 2nd fix is always a good sign that the end approaches. 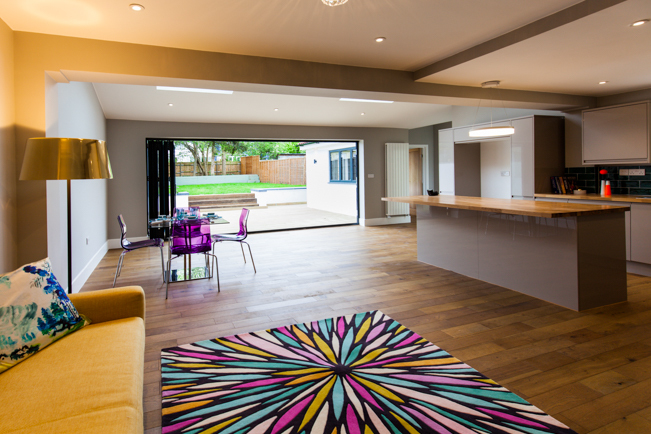 We used the same lights as next door to aid a cohesion and continuity between the two spaces. 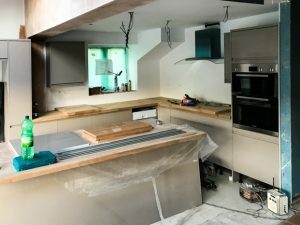 We’ve been making some good visible progress over the last couple of weeks, and if I dare say it the light at the end of the completion tunnel is well within sight. 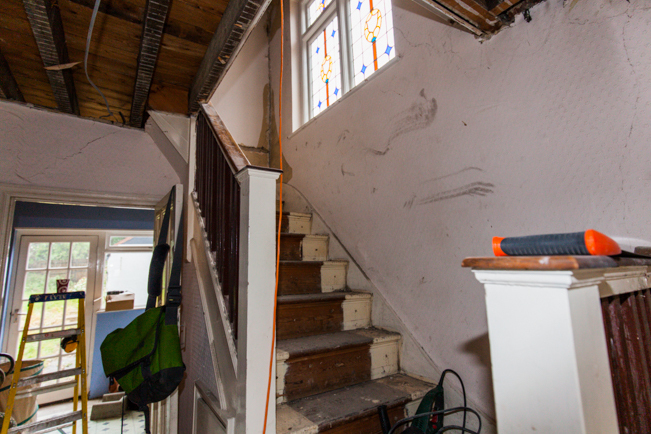 I hope so anyway as we’ve just bought a new project to start when we finish with this one. The steel work has been passed by Building Control and we’ve concreted in the base and started to box it in. 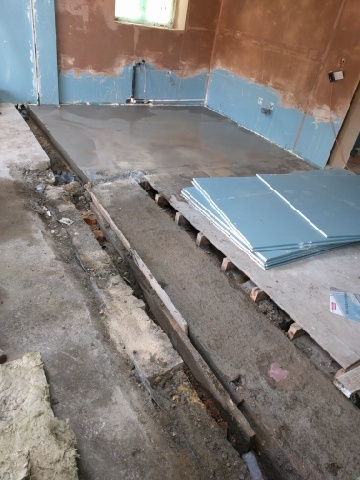 Just need to make good the floor around it now. 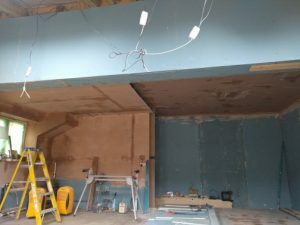 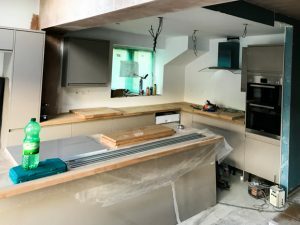 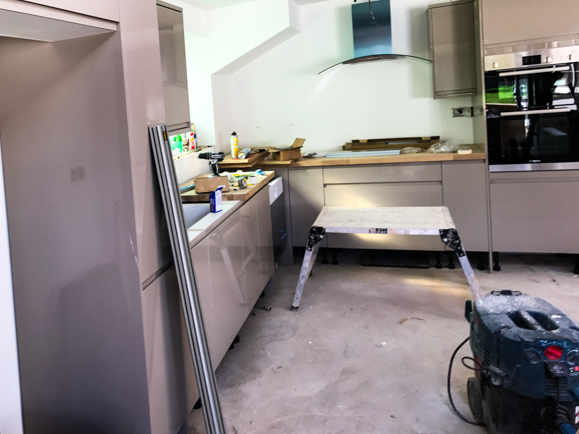 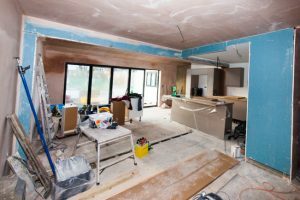 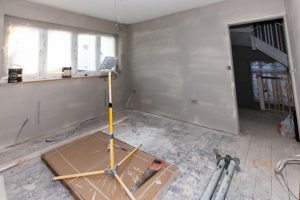 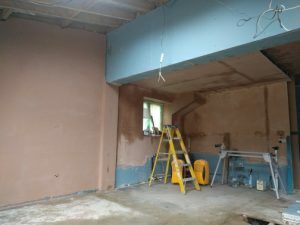 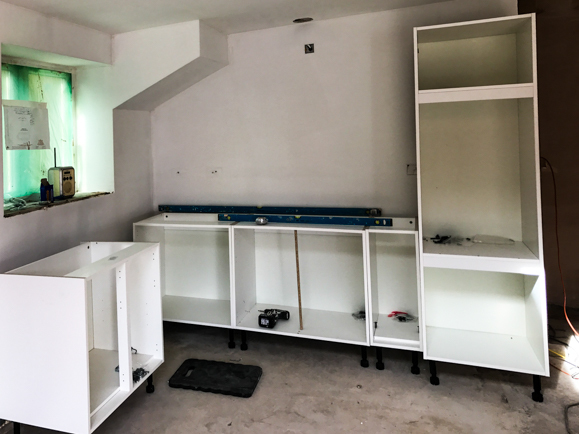 The kitchen area is coming along nicely too, we’ve boarded it out with 15mm 49DB sound reducing plaster board (we don’t need to use 15mm or DB board and it costs us more to do so, but a quality home ‘made for living’ as we say is what we are trying to achieve). 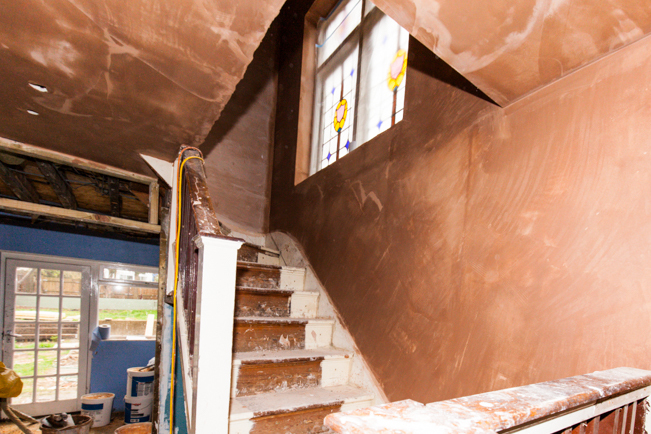 Then for a great finish we skim over the boards with plaster. Almost ready for painting! The roof has started to go on the extension and the Velux windows are in, a few more tiles and some guttering only left to finish. 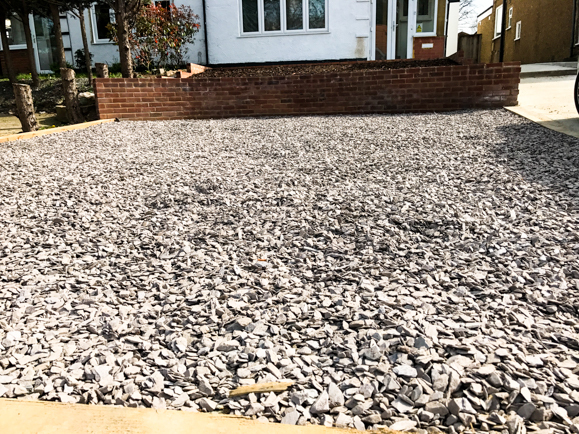 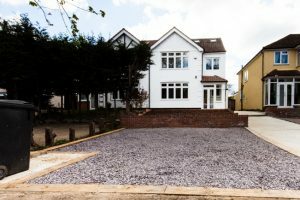 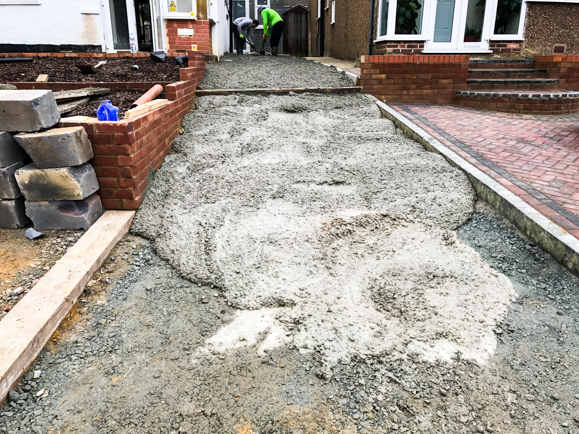 The driveway has been re-layed, we’ve only concreted the side of the house as it is a like for like replacement, to meet building control requirements for a porous surface, we’ll use some sort of slate or gravel for the parking area. As for next week, the kitchen is all planned and due for delivery and fitting. 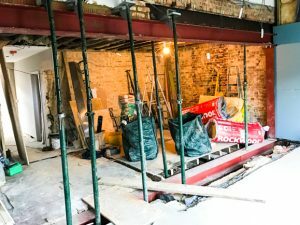 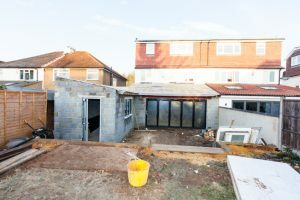 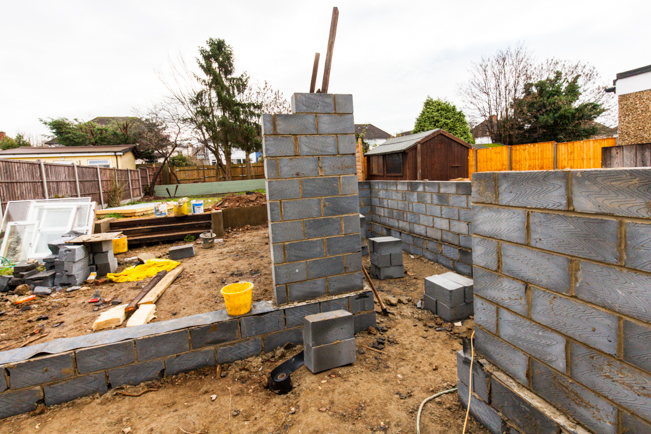 Not updated for a little while and sad to say that is because despite our best efforts to keep the pace going on the project our builder who has being doing the structure has been a ‘little’ lax at turning up to site and getting on with the job. 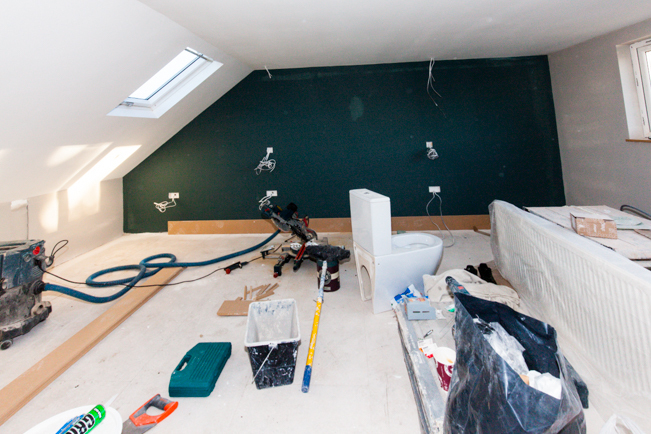 That said, we have made some good progress this week. 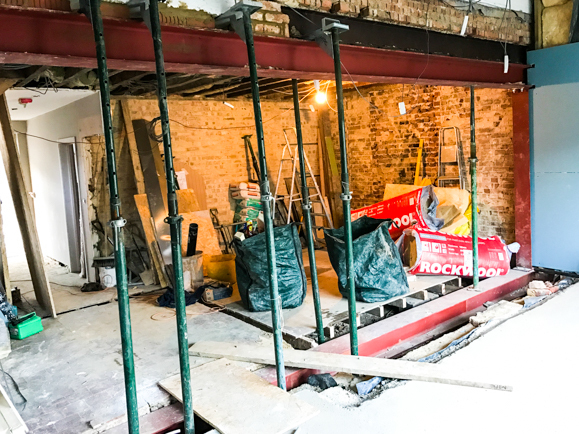 The steel work finally went in this week, despite a false start due to be delivered to the wrong size, so had to go back and be re-cut causing another weeks delay. Although, they still need a little more work, the base beam needs to be encased in concrete and the top needs building up to fully support the wall. 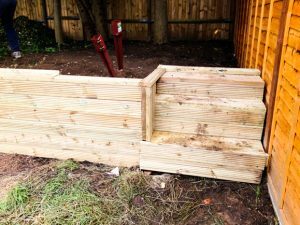 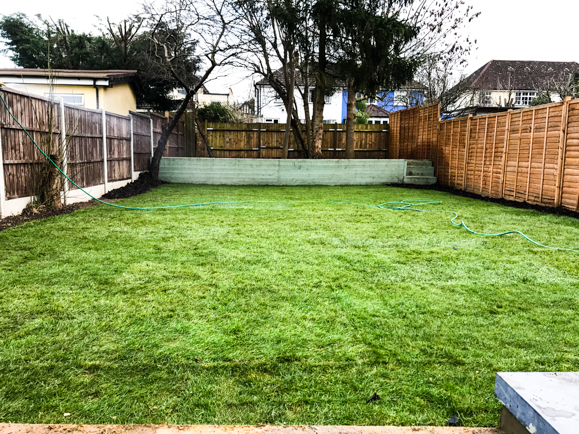 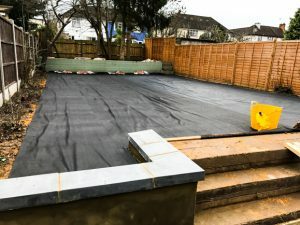 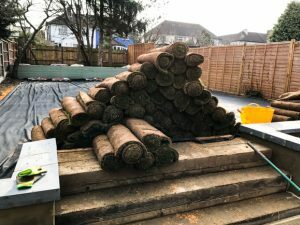 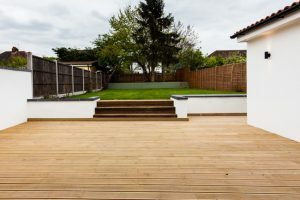 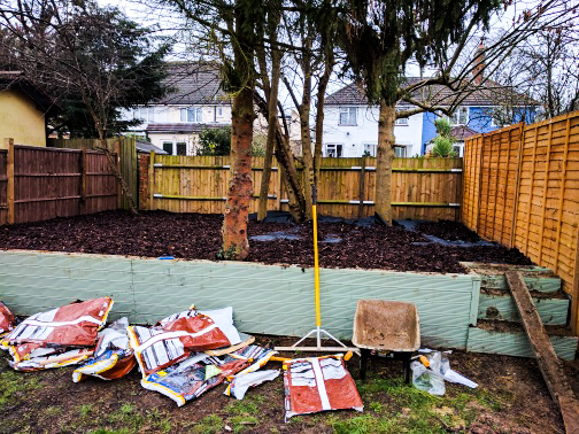 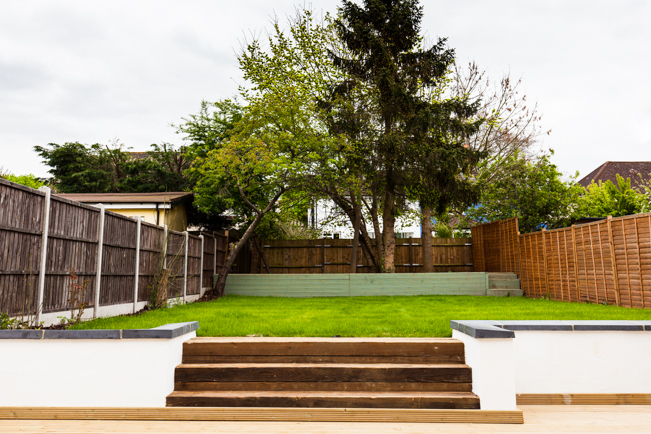 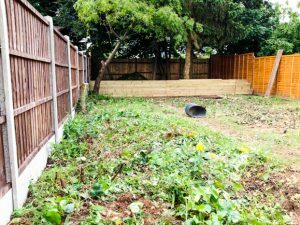 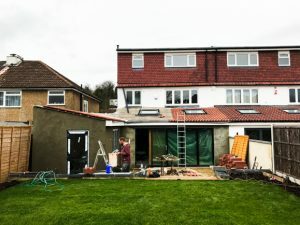 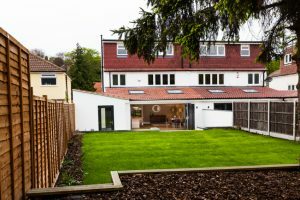 We’ve also been busy in the garden, as we wait on the builder to get the roof on the extension we have used the time to landscape and turf the back garden. 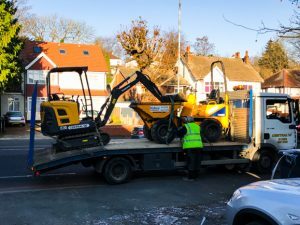 The front hasn’t been neglected either, we’ve prepped the main parking area firstly by getting a big machine to get rid of the big tree roots and then lots of ‘MOT’ sub base compacted into the ground. 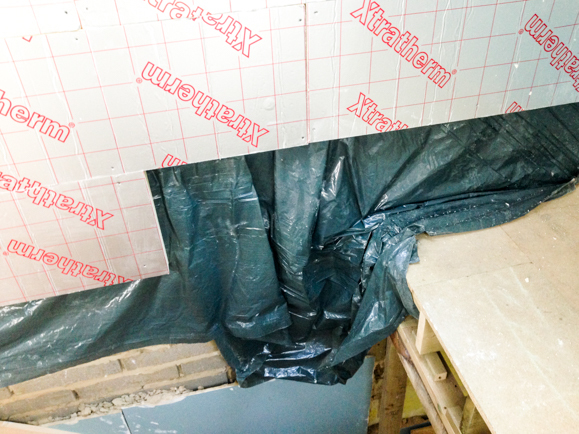 This gives a firm yet porous surface to meet the building regs. Just waiting for the aggregate to go back on the 3 for 2 deal and we’ll order and fill! 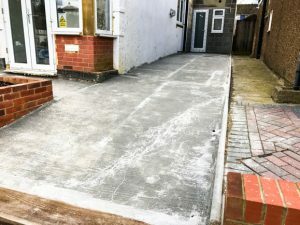 We removed all the old concrete and then similarly compacting down the MOT sub base ready to concrete the driveway, concrete booked for 8am Monday. Despite the very cold weather, zero Celsius out side, where much of our current work is we’ve been making some great progress and dare I say it the end does seem to be in sight, almost. 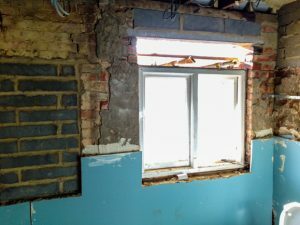 The windows and bi-fold door for the extension have all been fitted. 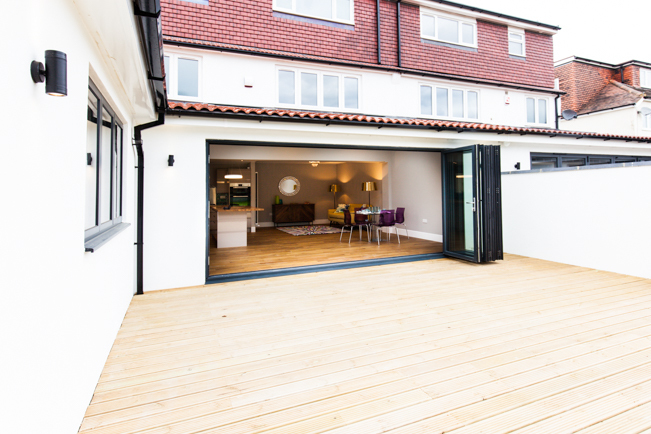 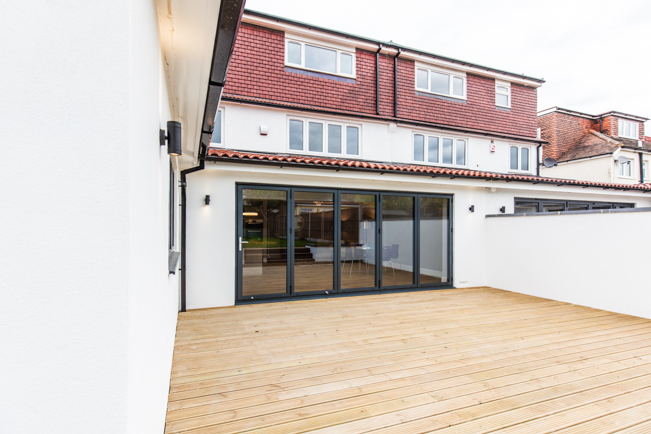 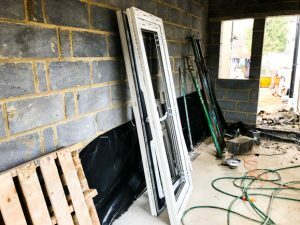 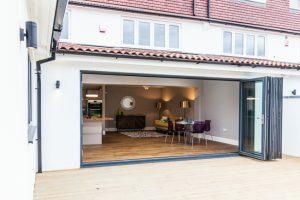 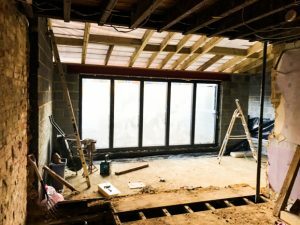 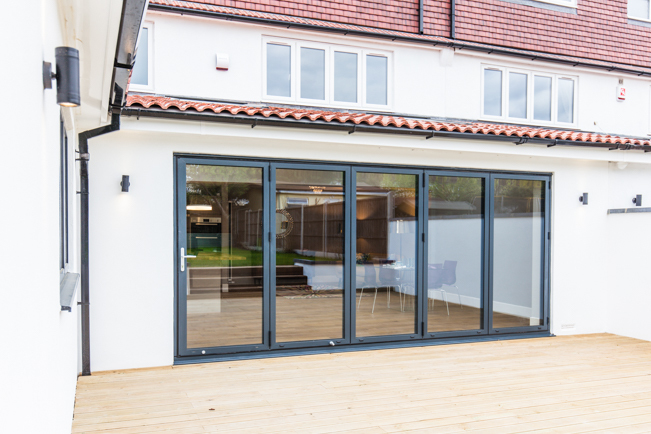 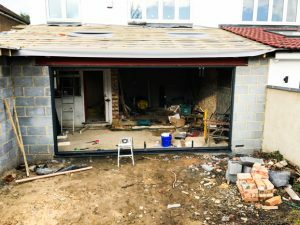 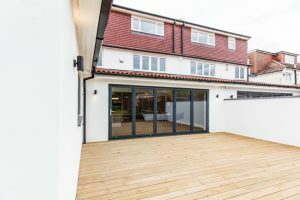 The bi-fold door the single most expensive purchase for the project but will give the crowning wow to the to what will soon be a great sized family home. 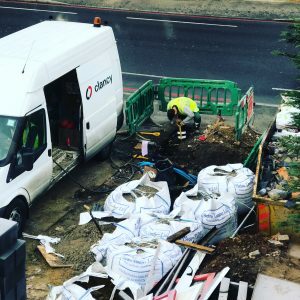 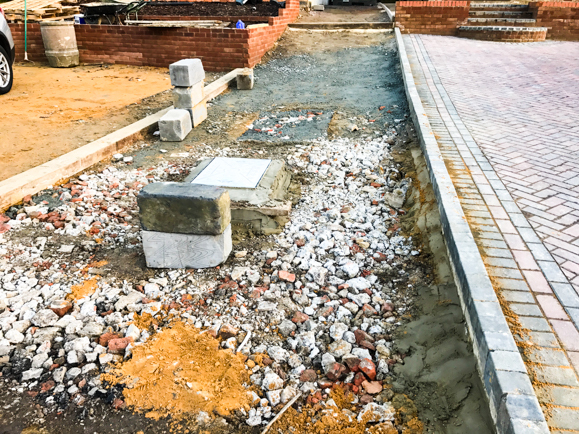 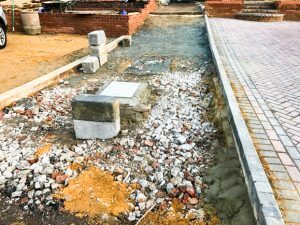 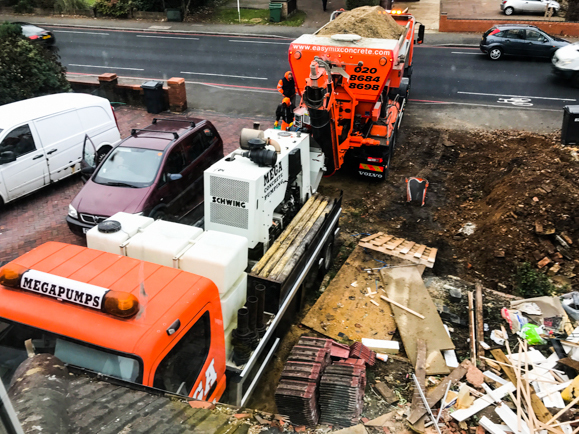 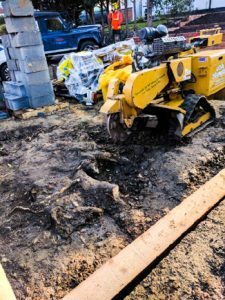 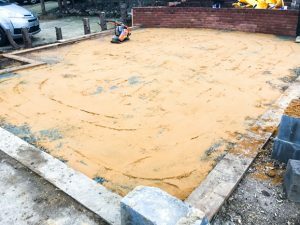 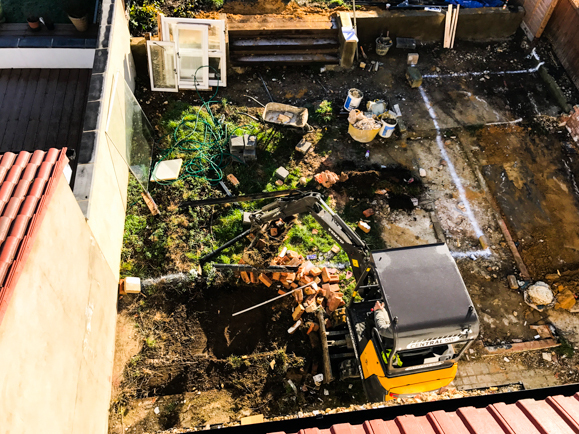 We’ve been tackling some of the groundwork and landscaping tasks on the job, although we were trying to put them off a little until things warm up a little but we’ve hit another bottleneck in the works as we wait for the structural steels to be delivered and fitted. 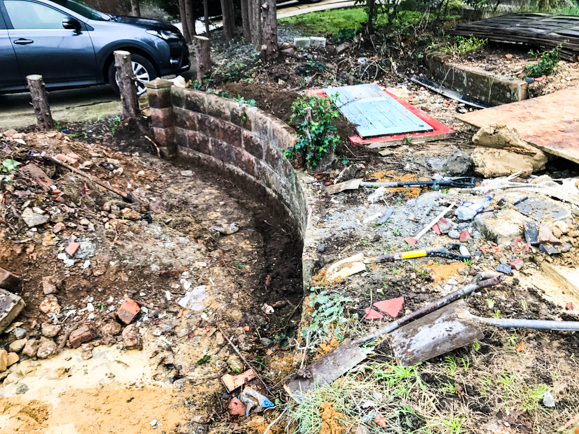 Despite initial hopes of restoring the old front wall we decided to rebuild a second skin in front of the old as this is much more aesthetically pleasing and provides a structurally sound retaining wall. 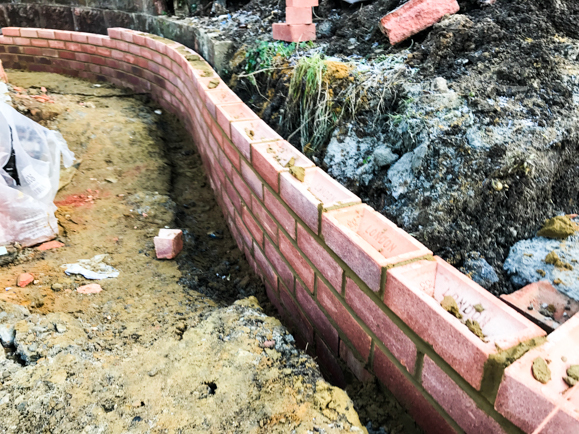 A big hand to our brickie for that lovely curve he is building into the wall. 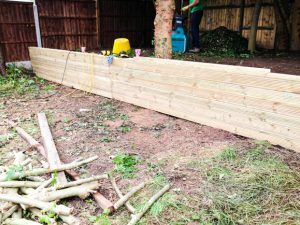 We’ve also been out at the very back of the plot, leveling and laying some decorative bark to our little wooded area, which I think is going to be a great space for a wild garden and kids adventures. The garden we’ve rotavated to help level out in anticipation of turfing at the end of the project. 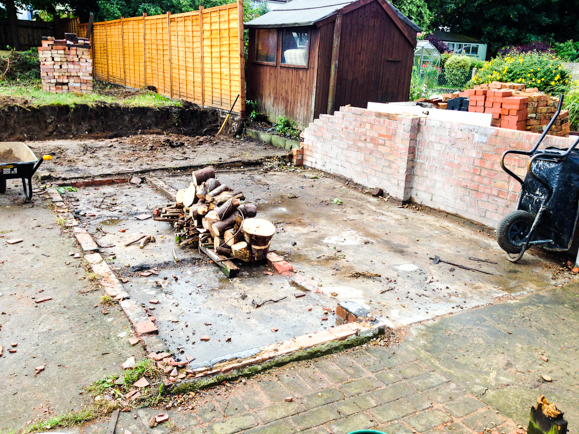 We’ve also started on the driveway, breaking out the old driveway ready to replace with some new concrete. 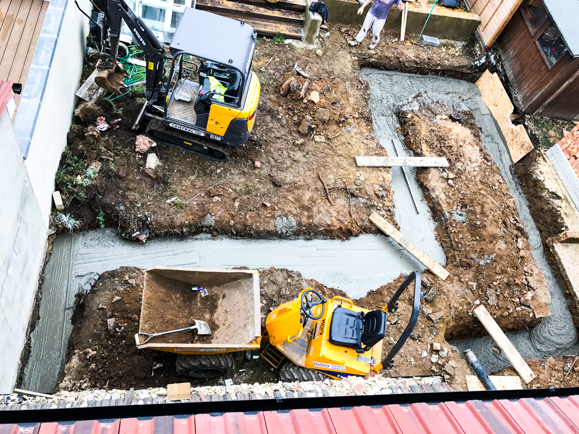 The wet wintry weather is not helping with all the outside work being done and needing to be done. 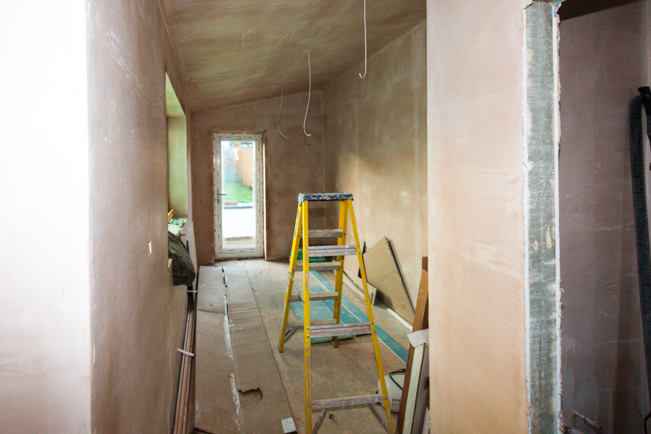 We did order the doors and windows though and the roof is going on so hopefully we will be weather tight soon. 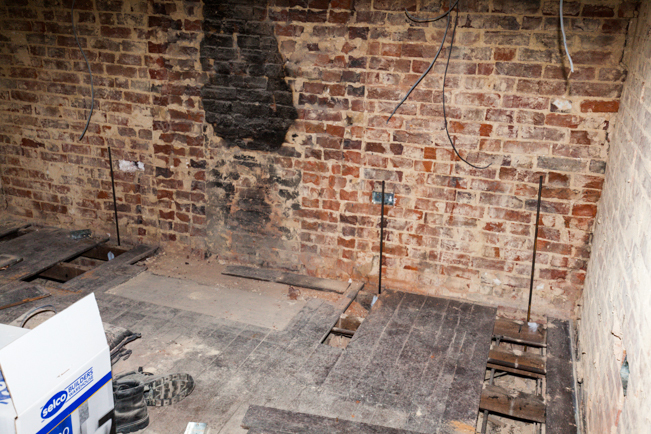 We’ve also started taking the back wall down, so we should be able to see the space in its open plan glory soon! The drains for the downstairs toilet are all connected and ready to go too. 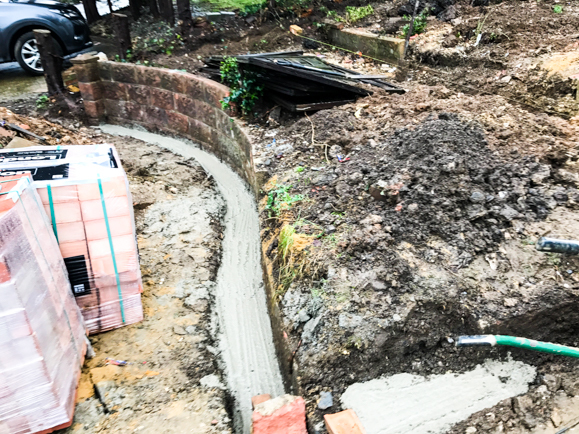 Finally we’ve also started work at the front of the house, nothing structural just trying to create two large flower beds built into the gradient at the front of the house. 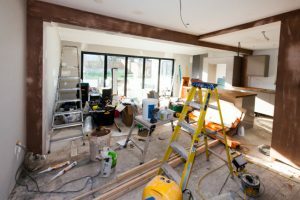 As you might anticipate the work on the house came to a bit of a halt over the Christmas and New Year break, and we’re not going to be back to a full team until next week. 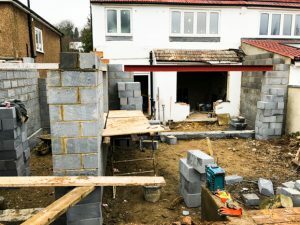 Which in some ways is quite good as the inside team is way ahead of the outside extension building team and it is giving them a chance to catch up a little! 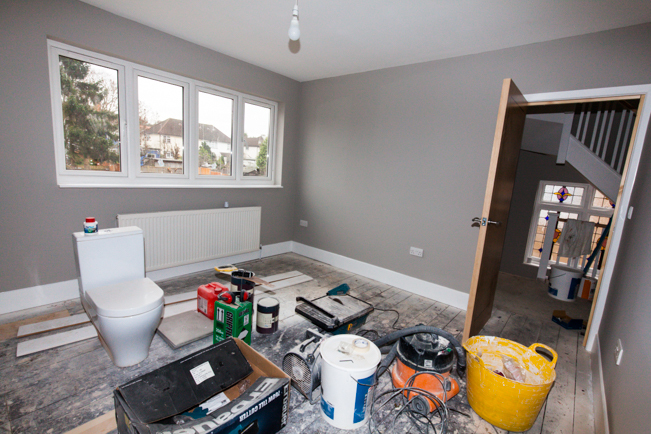 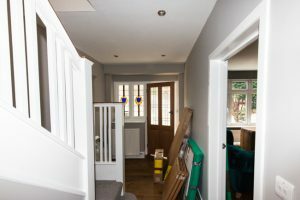 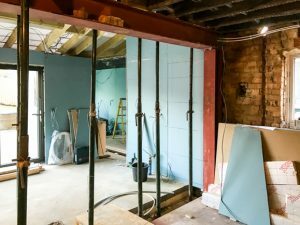 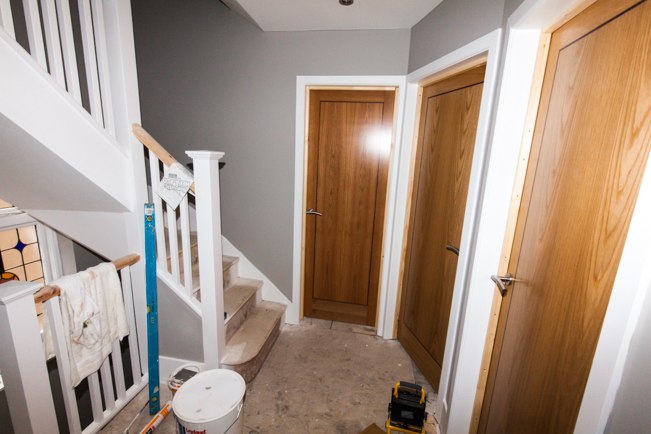 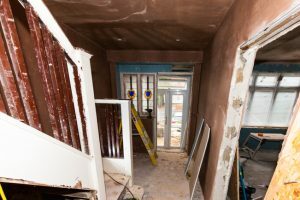 The big changes to the interior are that the bathrooms are pretty much completed, all the interior doors are hung, painting just needs some touching up to complete it and the electrics, bar a few light fittings, are all finished. Outside for the extension were not so far along, but still making good progress. The good news today is that we put the order in for the bi-fold doors, doors and windows for the extension. This week though saw the concrete floor and DPM (damp proof membrane) laid in the extension. 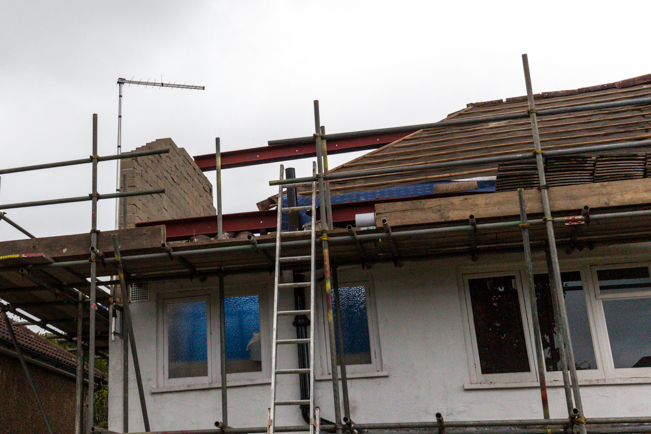 We’ve also got the main wood work for the roof on and just need to batten and tile, hopefully this week. 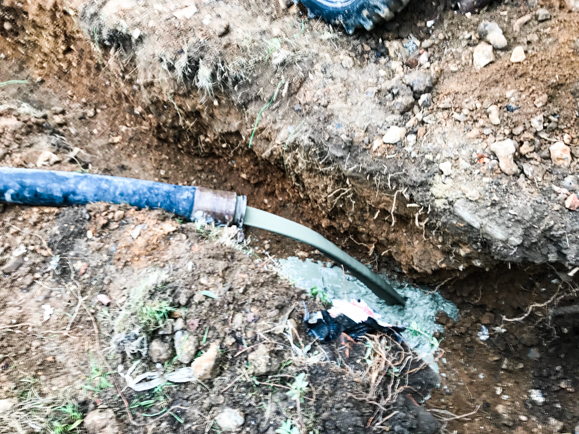 Finally, we also had the last section of lead pipe water supply taken away. 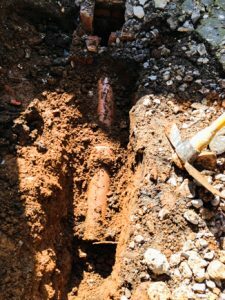 It took many weeks of chasing but the small section between the main water pipe and our water meter was dug put and replaced by the water company. 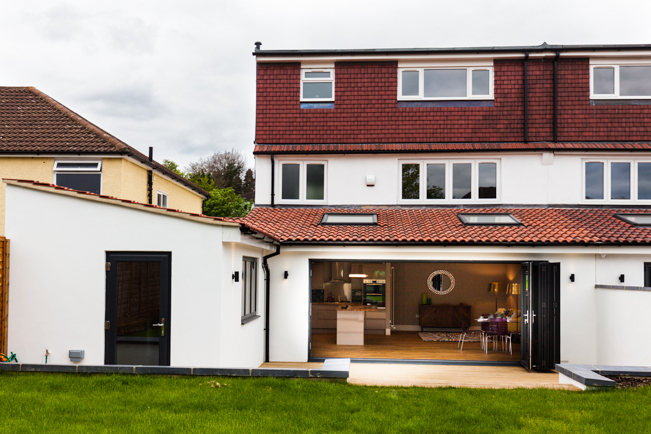 We’re still making a strong finish to the year, the rear extension is making great progress. The wall are pretty much to height, almost. 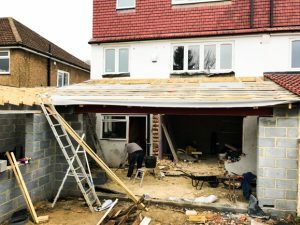 The big steel for the bi-fold doors had to be hand-balled into position; builders heads shouldn’t go that red when lifting! 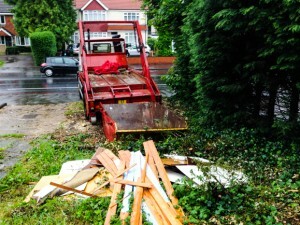 They did manage to maneuver it into position though. 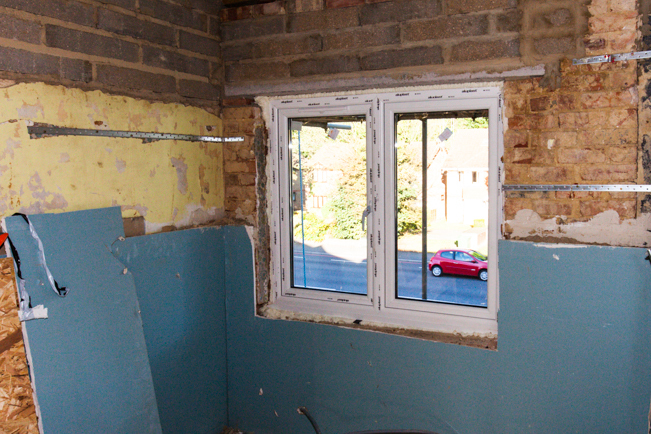 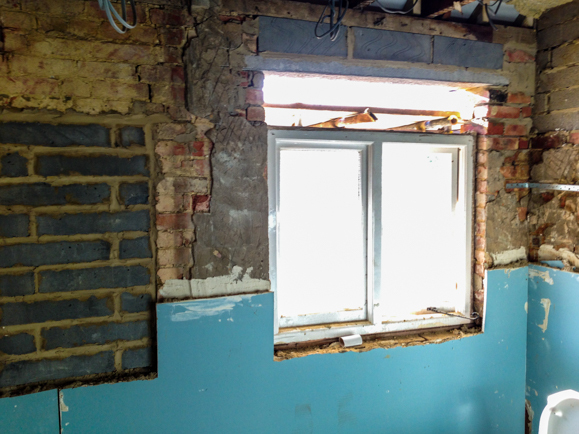 The lintels for the utility room are also in position. 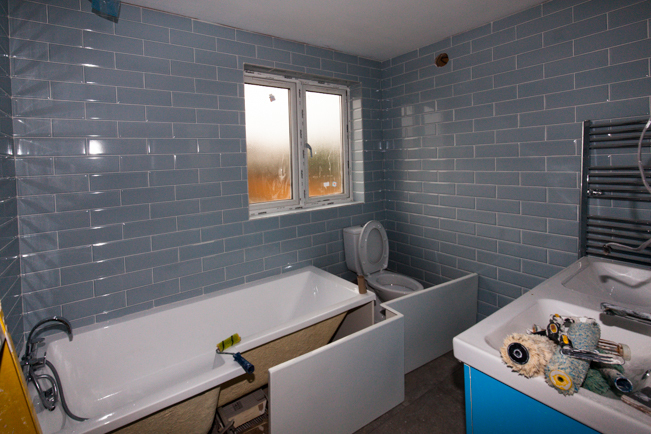 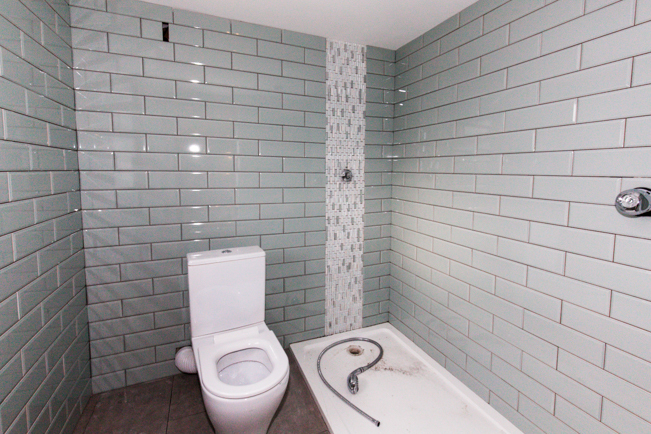 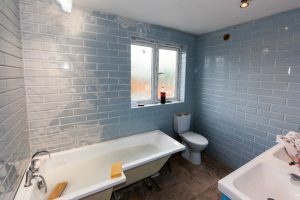 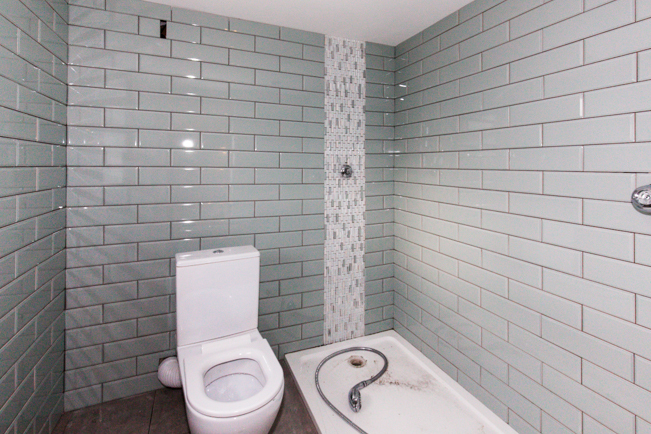 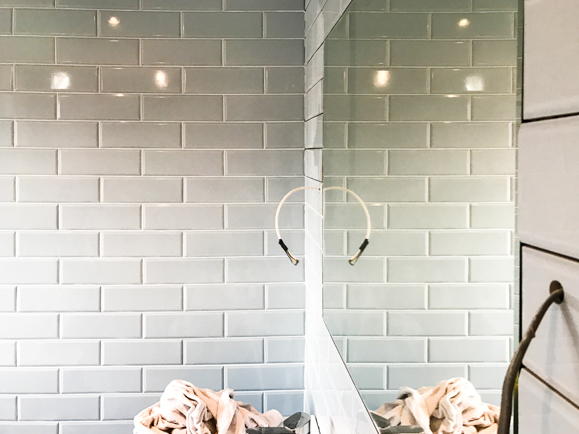 The interior is also making similarly great progress, the bathrooms are now fully tiled and grouted and very almost finished completely. 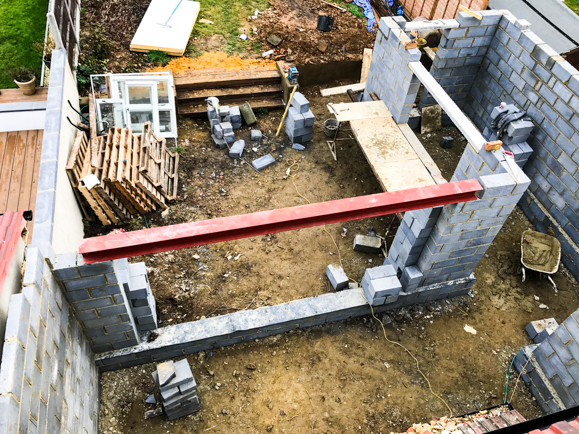 The extension is flying upwards now, the steel lintels should be installed in the next day or two and then on to the roof. The interior especially the bathrooms coming on a treat too, the tiling complete and just the grouting that is getting finished off today. 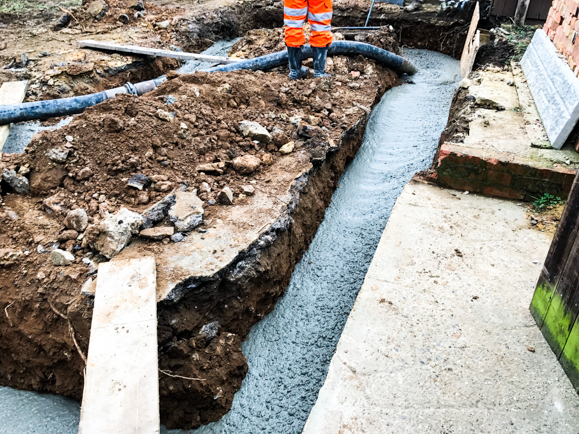 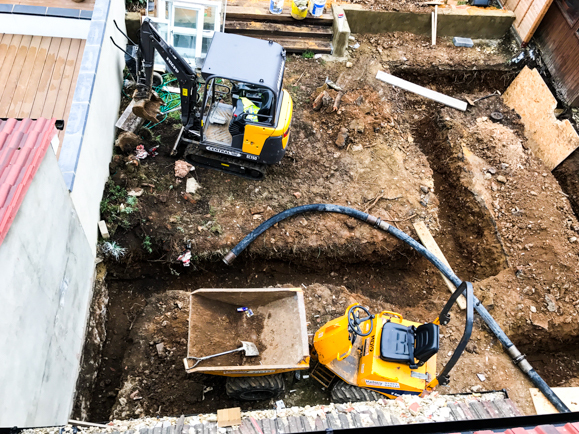 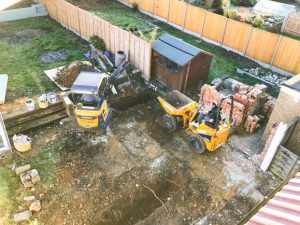 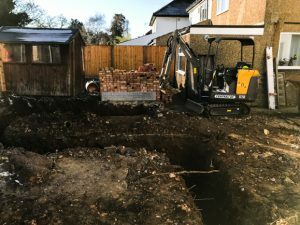 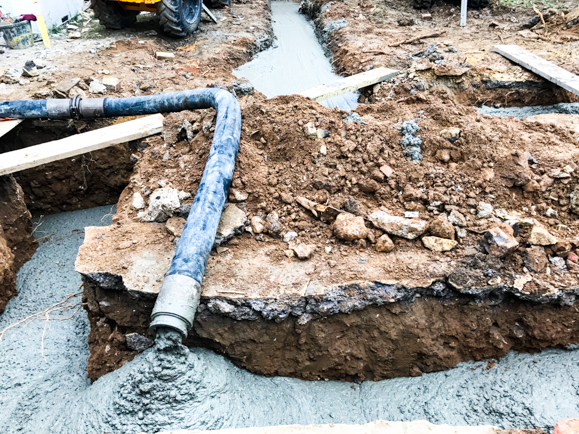 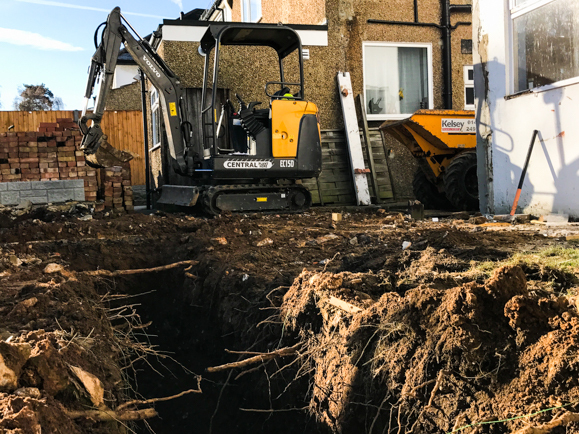 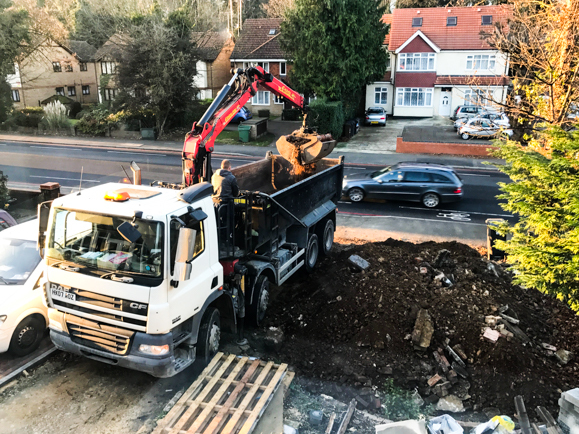 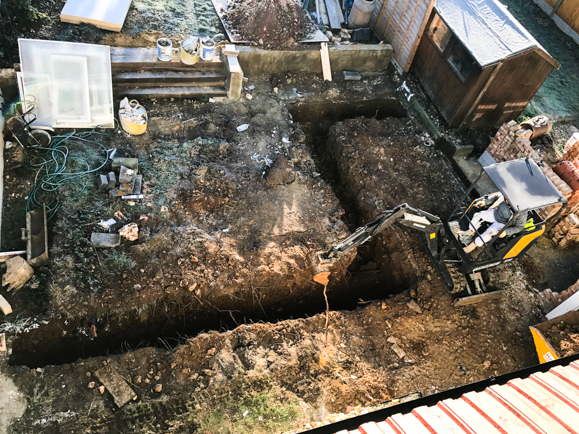 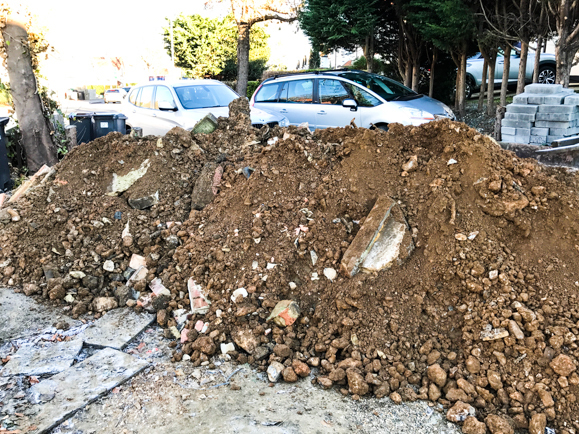 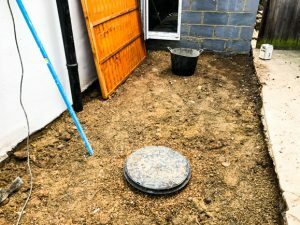 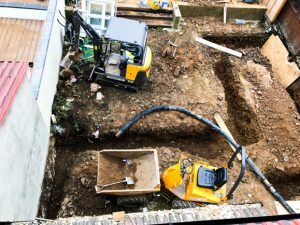 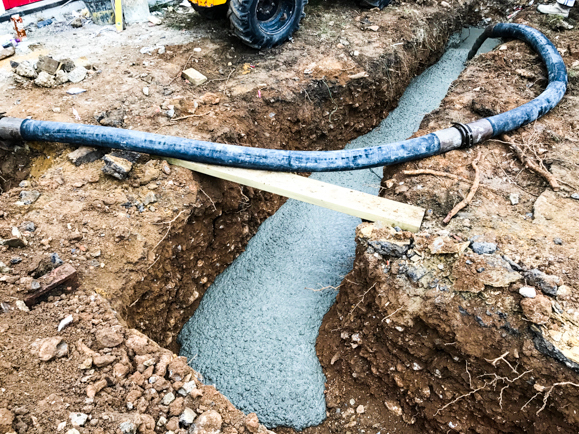 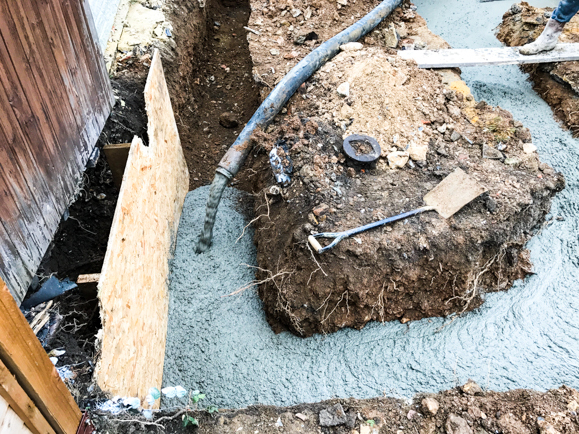 A very exciting week this week, we finally started digging out the foundations for the rear extension and then after all that digging and spoil removal, we filled it back in again with about 17 cubic yards of concrete. 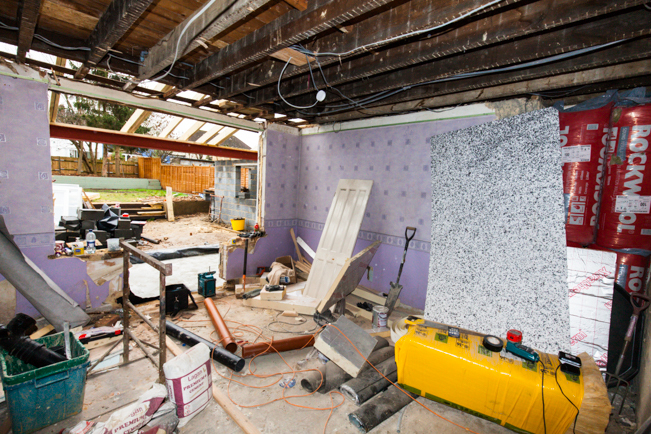 The builders for the extension are due to start tomorrow, so we’ll finally see the project get up to full speed. The interior has been coming along quite fast though, radiators are fitted and plumbed and the first coats of coloured paint have been applied. 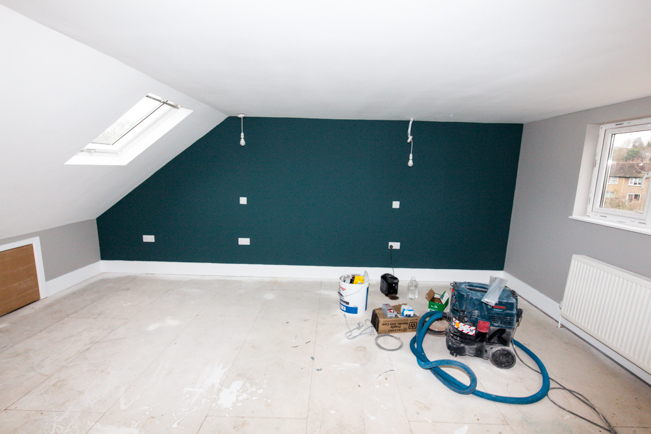 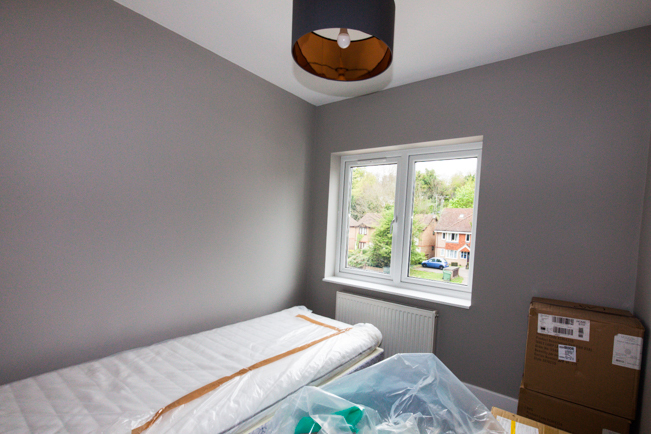 To add that touch of luxury we are using Farrow and Ball paint throughout. 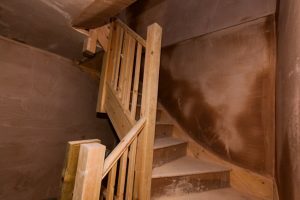 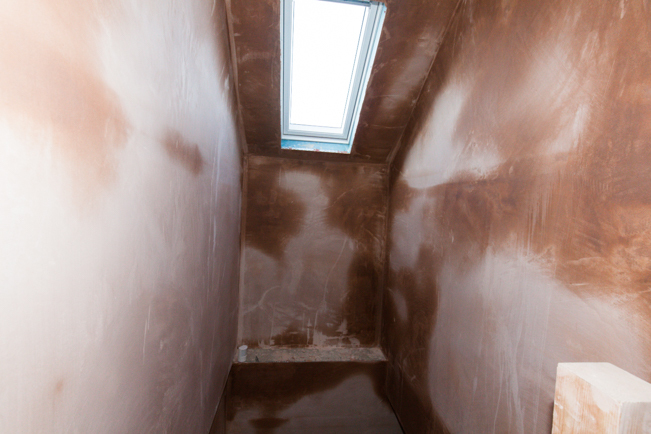 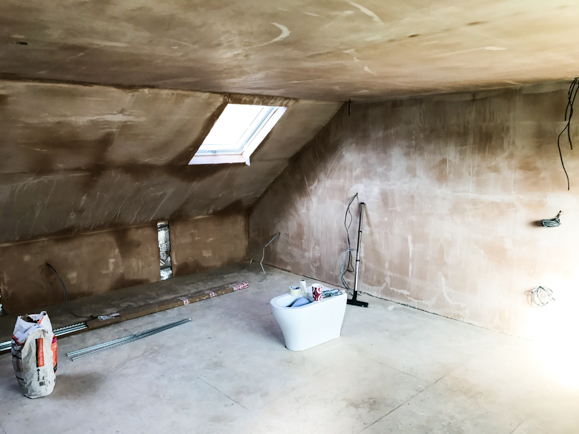 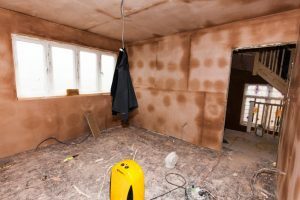 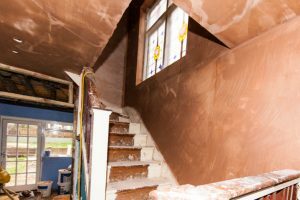 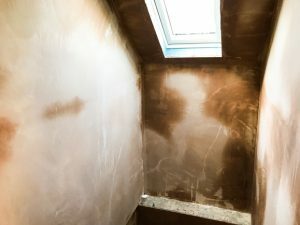 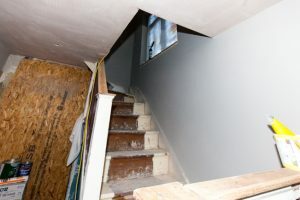 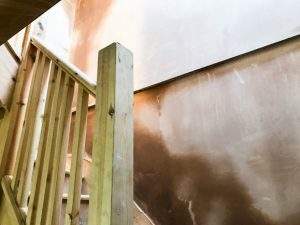 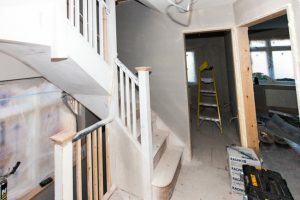 The inside looking ‘almost’ finished now as the majority of the plastering has been done, as you can see in the loft picture we’ve started sanding to create a great silky smooth finish. 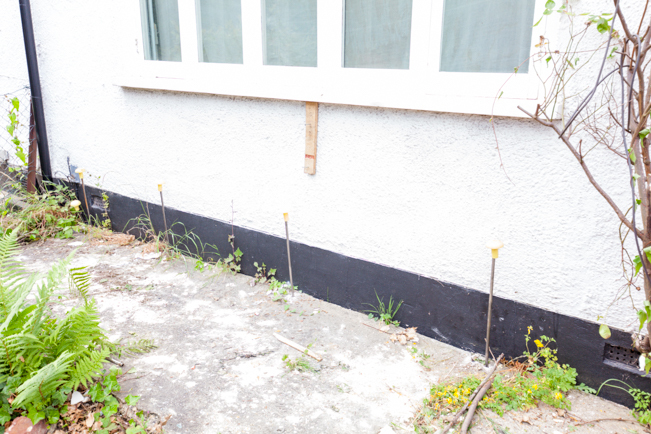 The outside almost done too, the scaffolding is down finally just a little patching where the poles touched the wall. 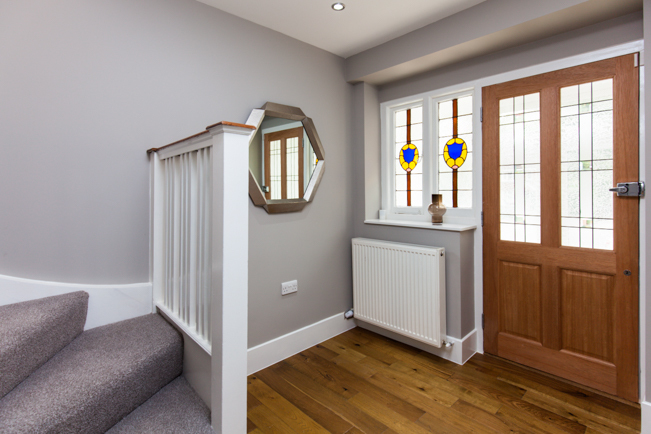 We’ve also double glazed the porch entrance for extra comfort and security. 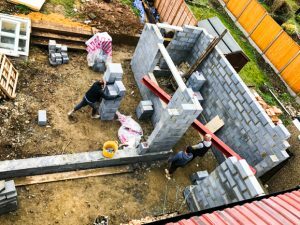 Last few weeks has mostly been about Half Term holidays and a lovely trip it Italy. 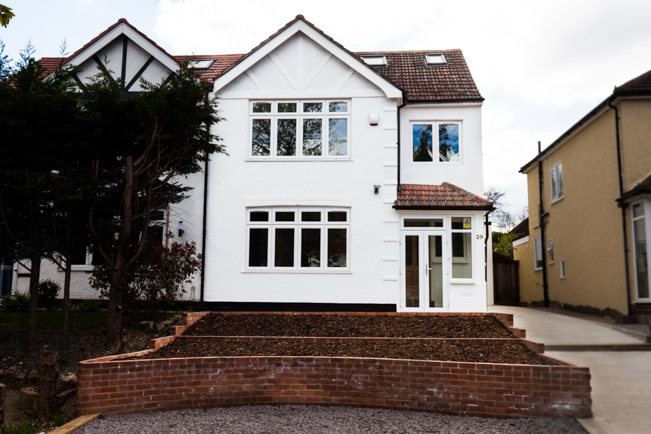 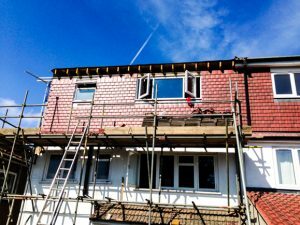 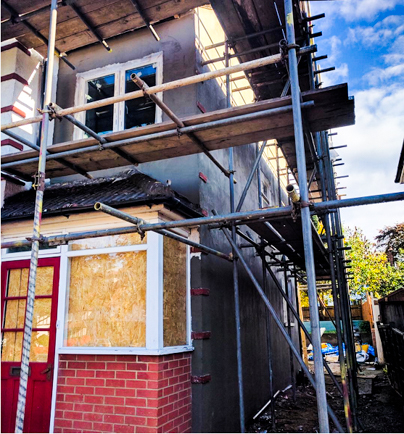 The house however continues to progress, the out side has been rendered using Johnstone’s Stormshield High Performance Render, a cement based high polymer formulation developed to provide an all weather, tough and long lasting render. …and then for a super smooth finish, a quick skim of plaster. 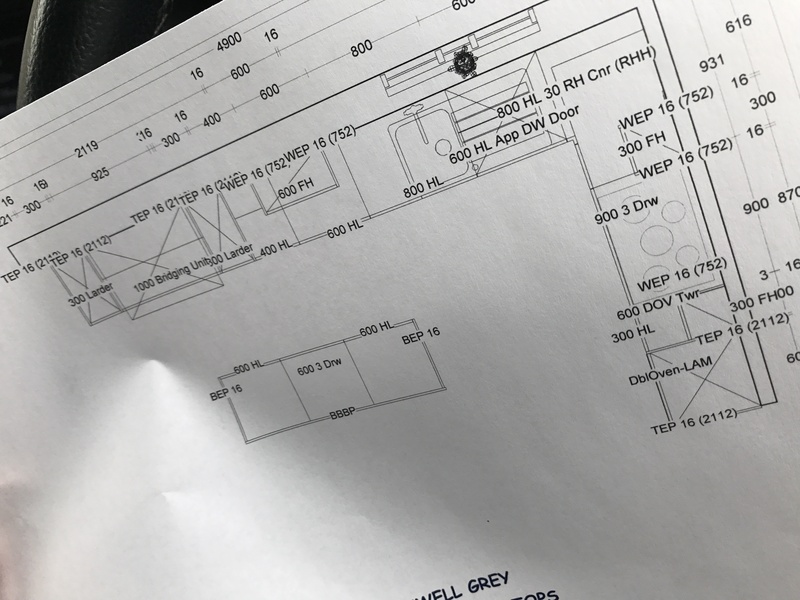 A joyous week, 20 weeks after we originally put our planning application in (6 weeks planning and 14 weeks appeal) we finally got the go ahead to proceed with our plans unhindered. 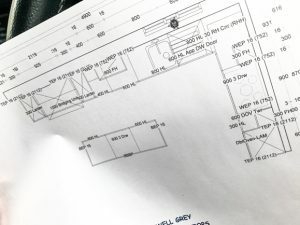 Great news as we can finally get into gear and get going on the project. 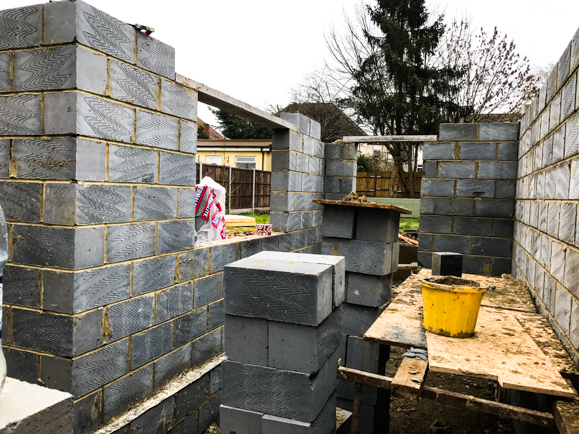 That said, my structure builders have had to go to another job for a couple of weeks but my internal guys started at the end of the week. 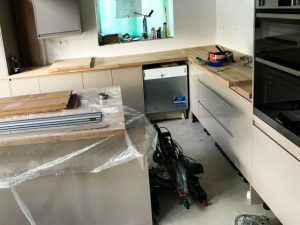 so we’re not quite into full speed but at least we are getting out of first gear. 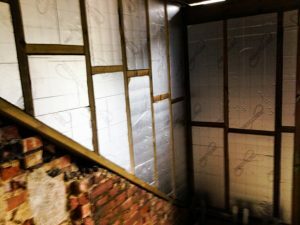 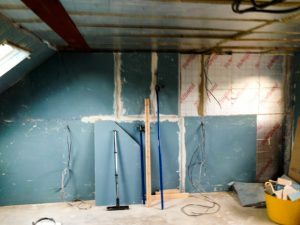 The only insulated wall in the loft got a bit of attention, the vapour layer and insulation layers going onto the wall. A figures crossed week this week, as we have the Planning Inspectorate visiting to adjudicate on our planning appeal. 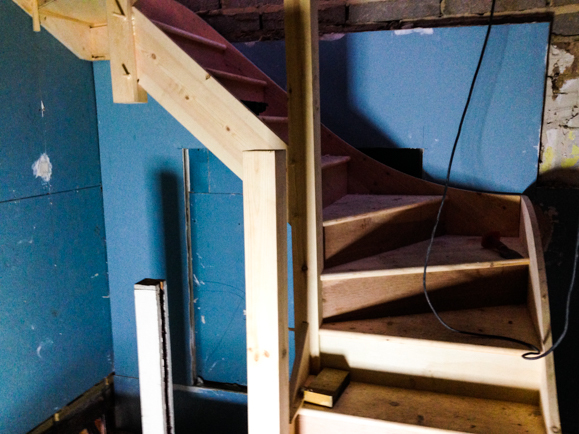 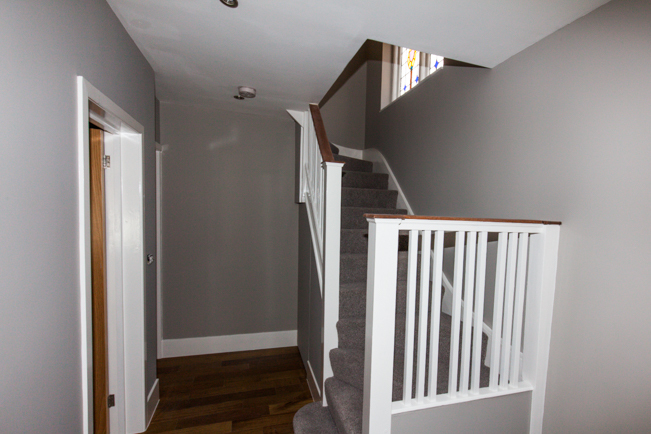 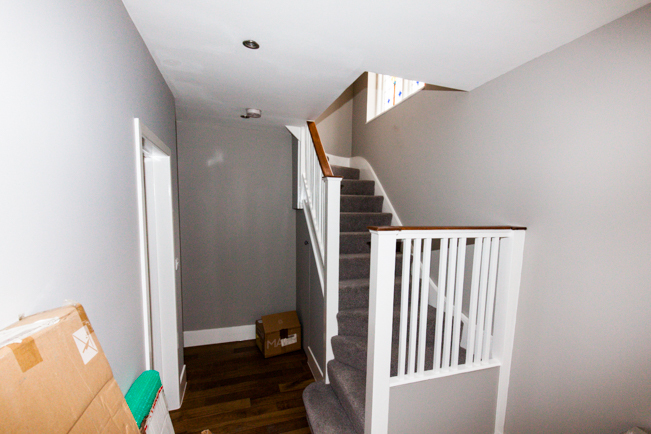 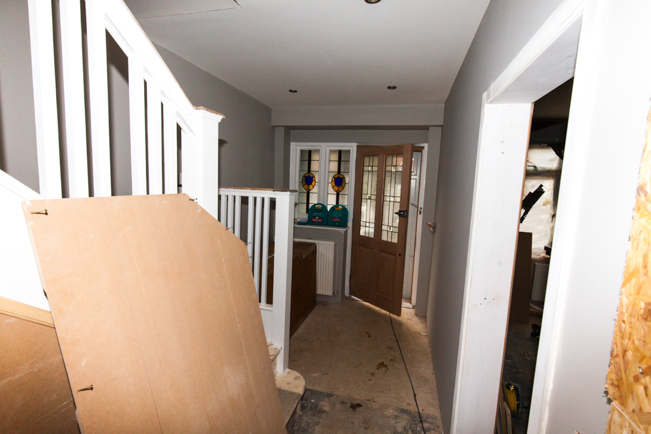 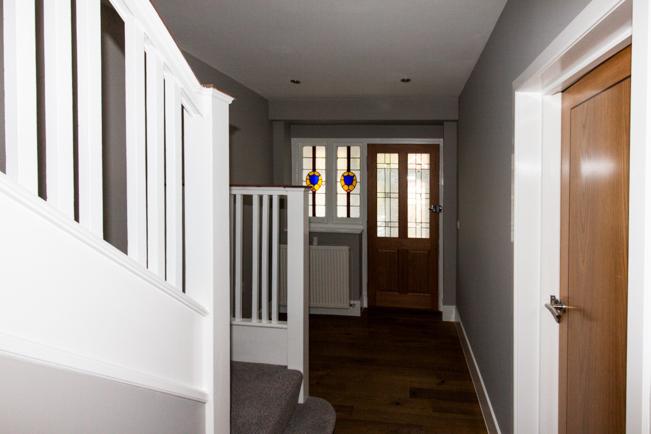 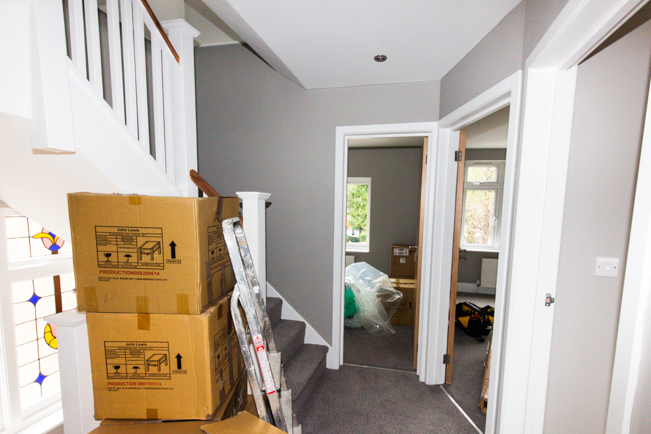 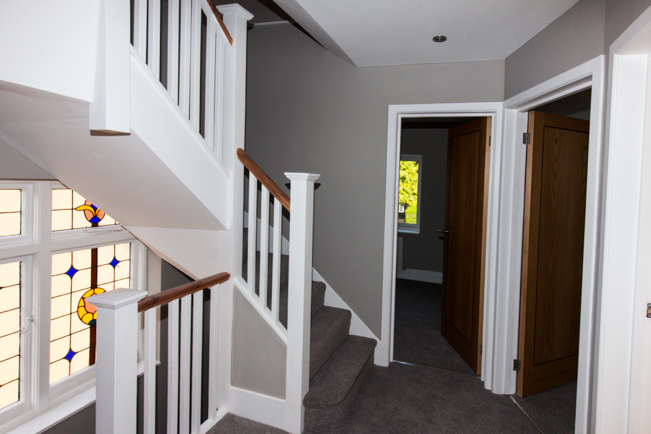 In the mean time we plod on; the stairds are proctically finished now we have stair rods and banisters. The gable wall has been battened out ready for, you guessed it, more insulation to be attached. 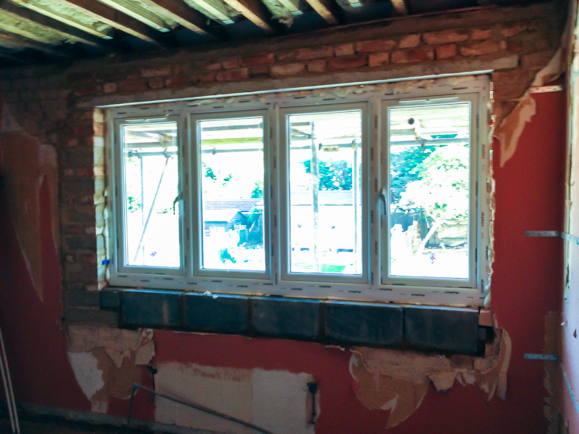 The rear double glazed windows arrived and have been fitted. 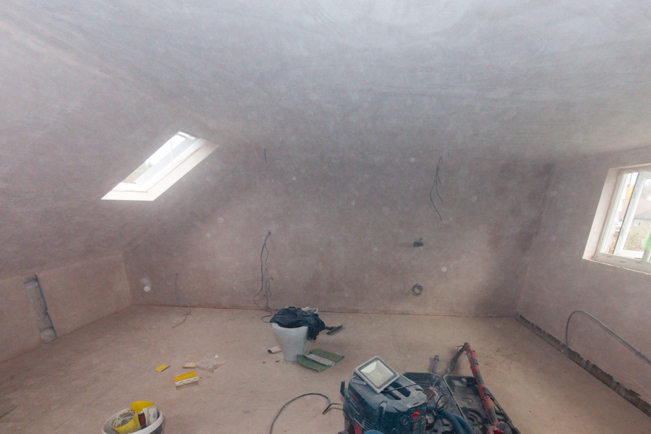 The roof is finally back on and water tight. 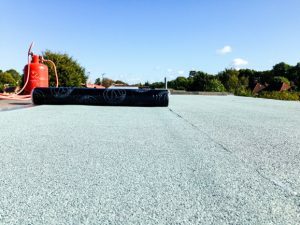 We’ve used the torch on bitumen roof felt to keep in with the brief of trying to match next door to give better cohesion between the two projects. 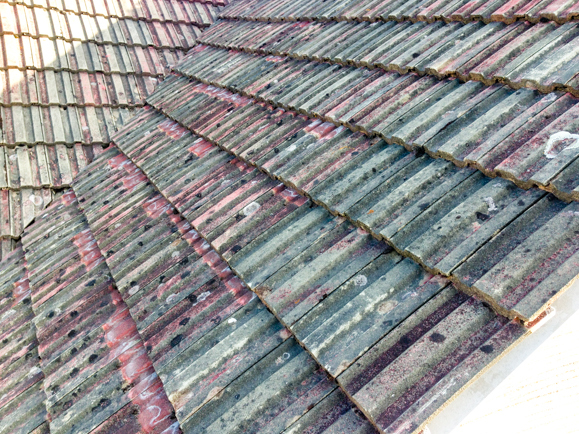 The tiles for the existing roof to the front have all gone back on. 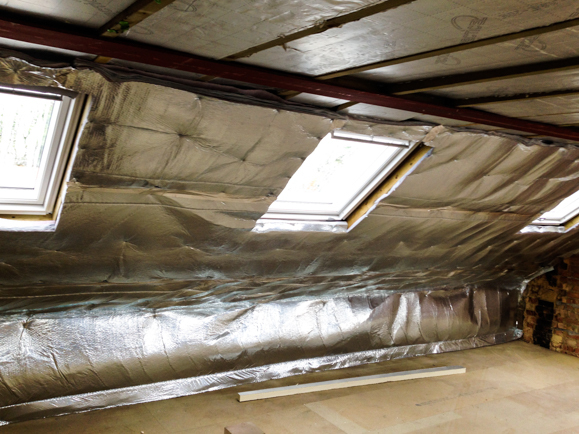 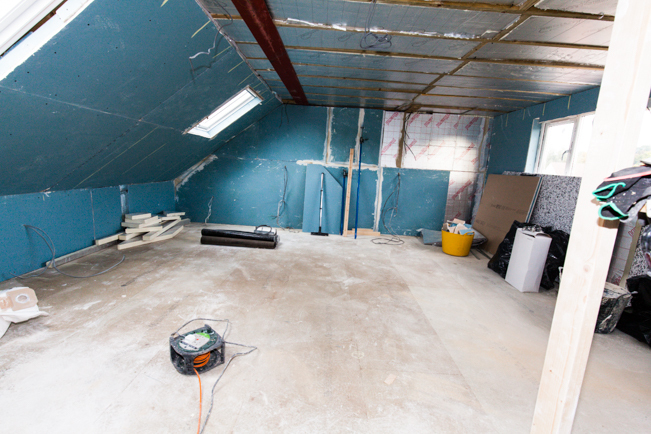 We continue to add more insulation to the loft, to create a super warm and quiet space. 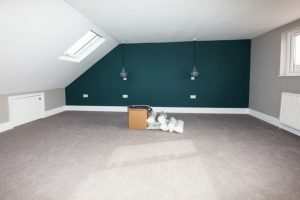 We’ve used AlumFlex on the sloping roof to maximise the roof space. 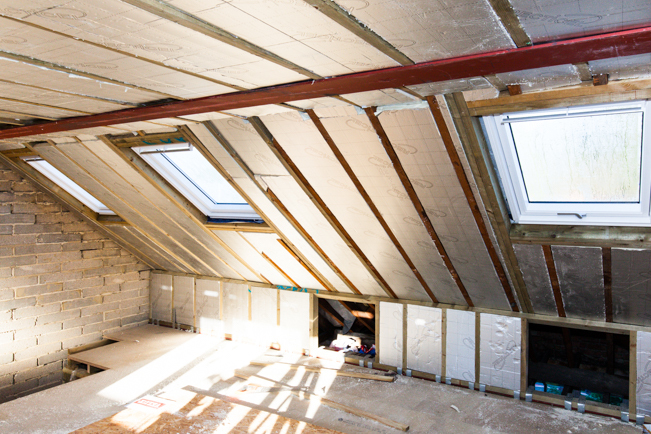 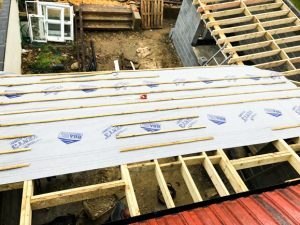 Alumaflex is a thin and highly efficient 14 layer multi-foil insulation designed to help reduce energy costs and save on space whilst meeting the thermal requirements of Building Regulations. 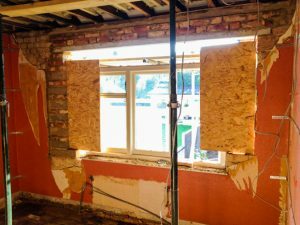 We’ve had a bit of a delay on the supply of the rear double glazed windows, but the holes are all prepared ready for them to go in. 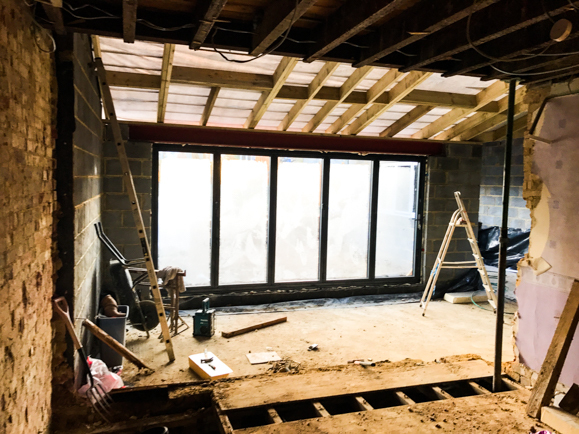 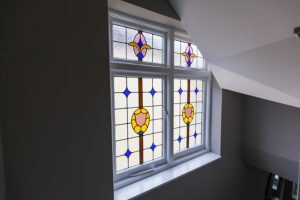 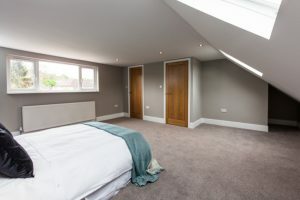 We’ve lifted them up a little to make way for the pitch of the down stairs extension and we’ve shuffled the bedroom window along a little once again to mirror next door, to maximise the aesthetics of the finished project. 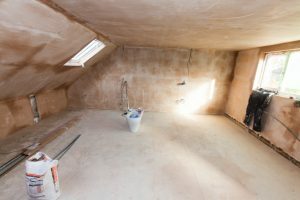 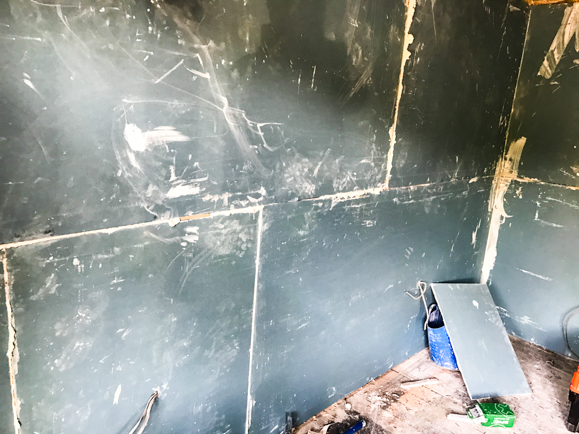 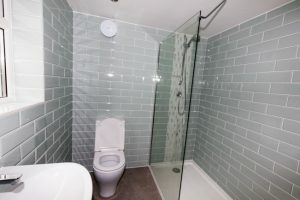 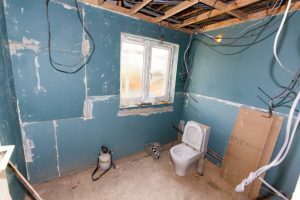 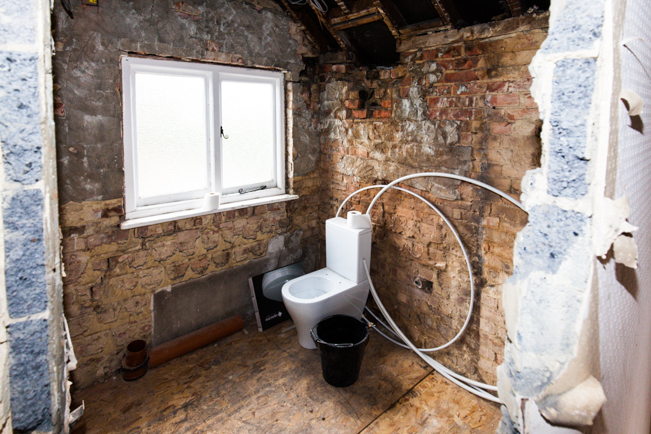 As we’ve combined the toilet and bathroom to create a large family bathroom space, we’ve taken what was the lavatory window away so we can better layout the bathroom furniture. Great news this week, we’ve a date for the planning appeal. 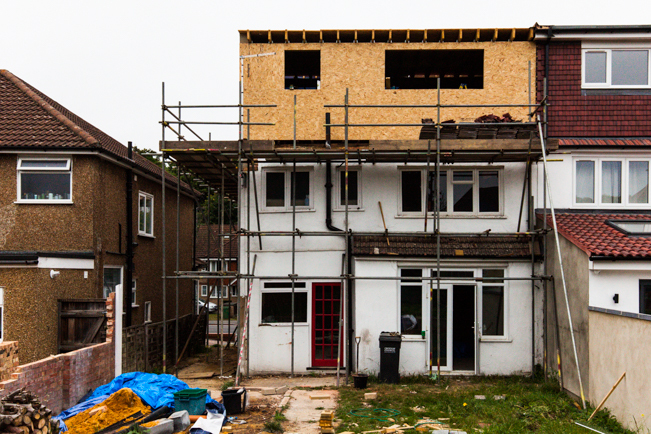 The Planning Inspectorate are coming on the 4th October; raring to shift into gear once we get their adjudication. 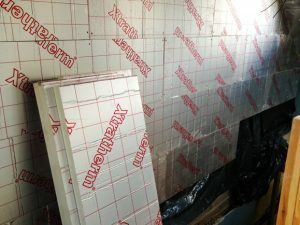 roof and wall insulation which was all given the approval by building control this morning. 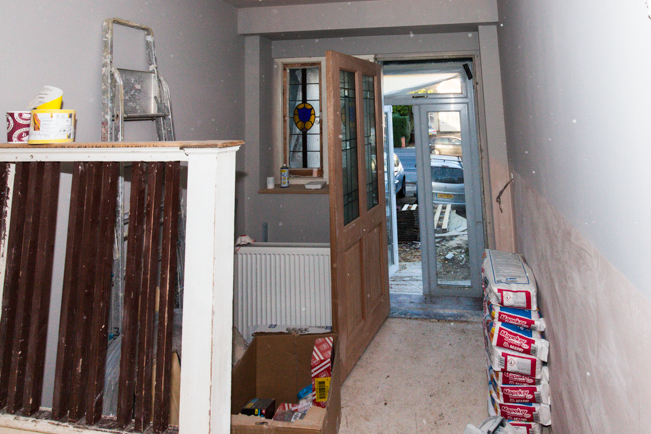 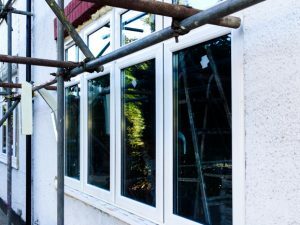 The double glazed windows have also been fitted to the front of the house. 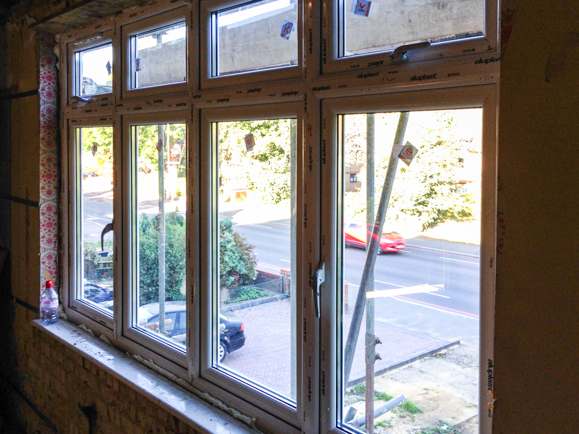 The windows are looking and sounding (or rather lack of sound) great. Laminate glass for maximum noise reduction and K glass for maximum energy efficiency, these windows couldn’t be any better. 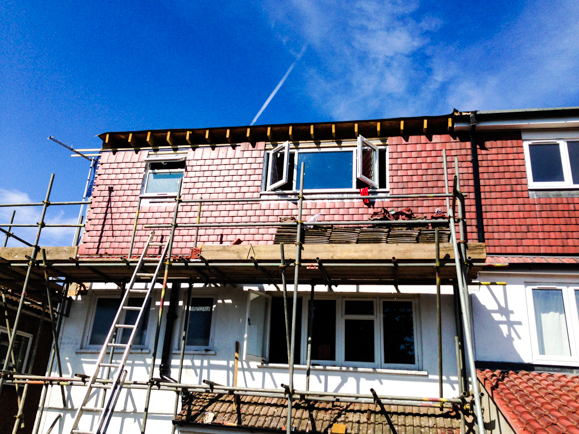 Making great progress on the loft, the front tiles are all on. 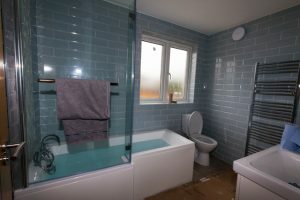 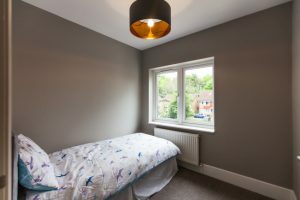 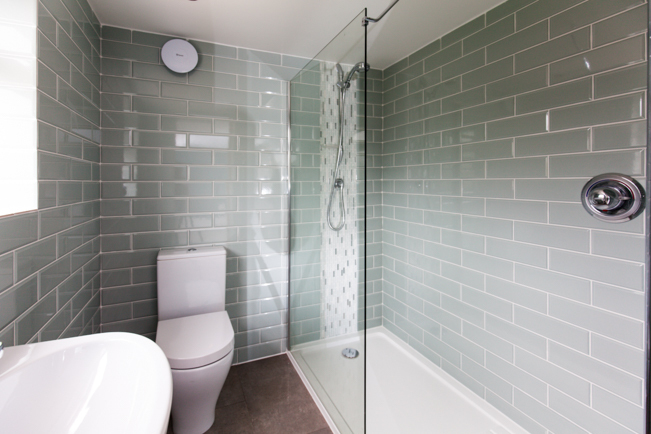 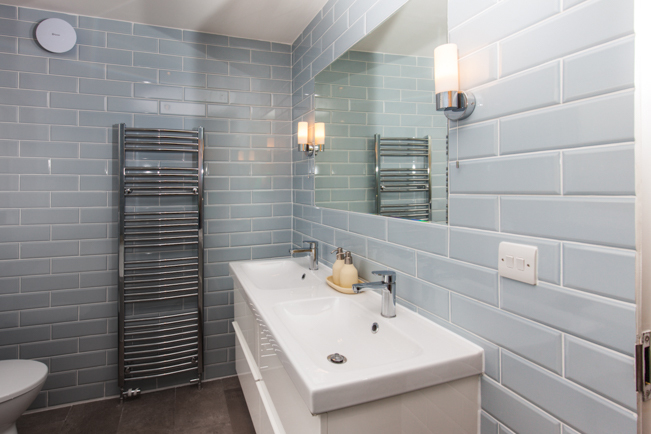 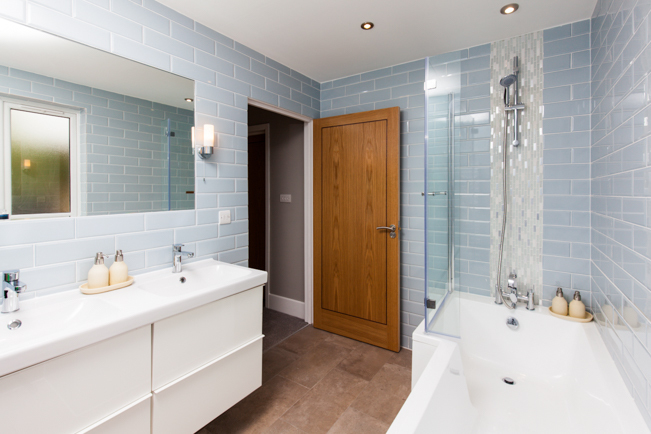 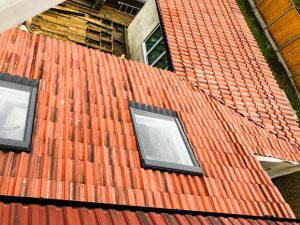 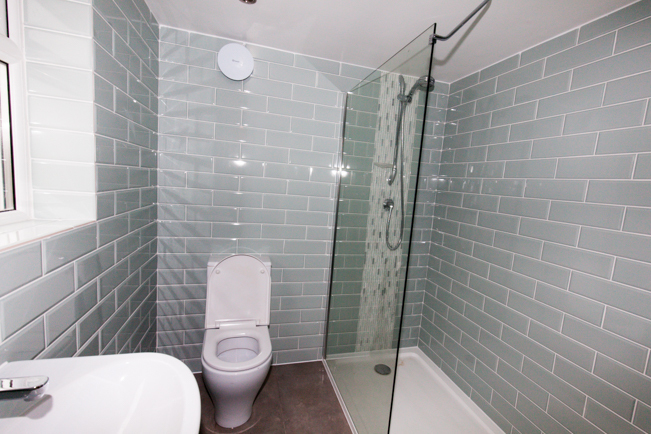 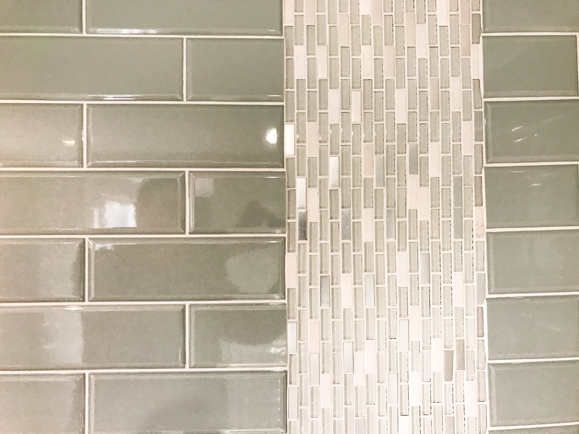 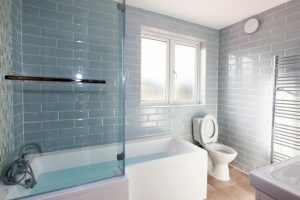 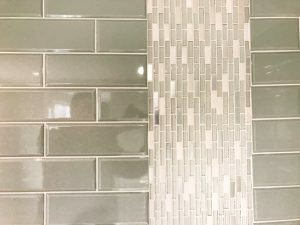 The builder’s brief was to mirror next door as much as possible and they have done a great job and blended the tiles in together beautifully. 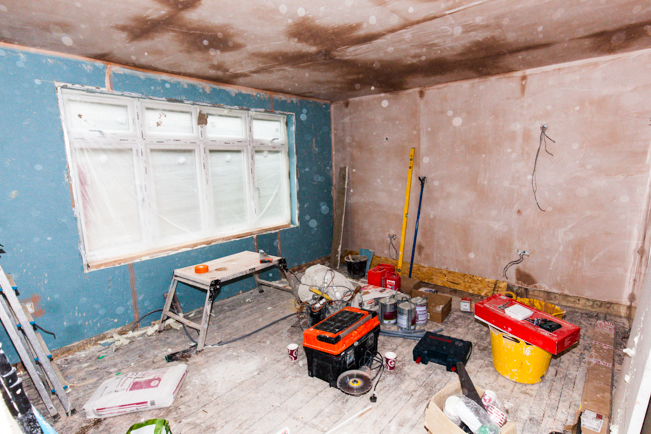 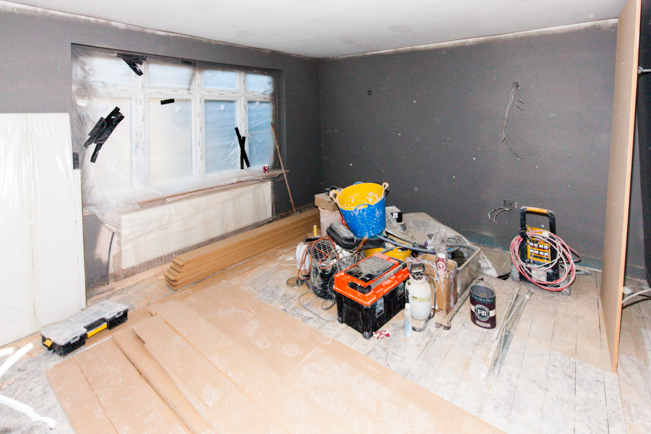 The inside is progressing nicely too, most of the insulation in the wall and floors has been fitted. 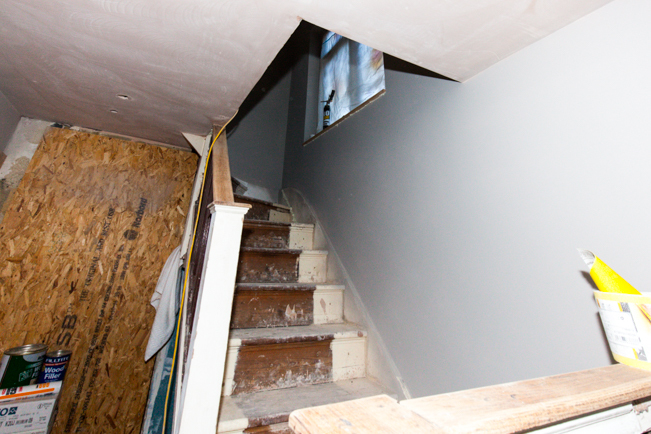 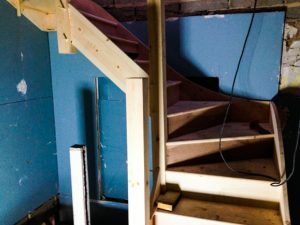 Best of all though, we now have stairs going to the loft space, no more ladders to get up there, yay! 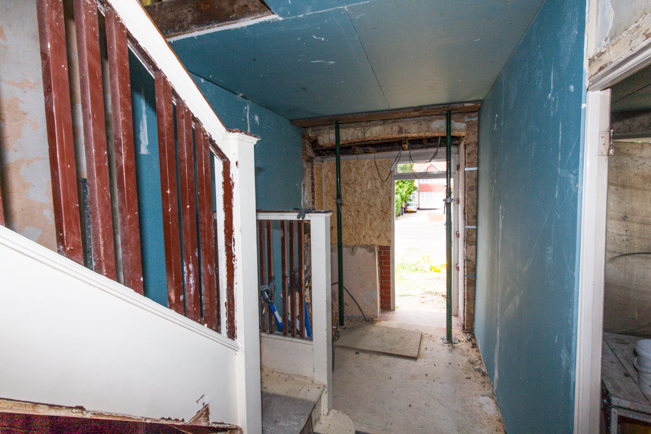 The oft construction continues, all boarded up. 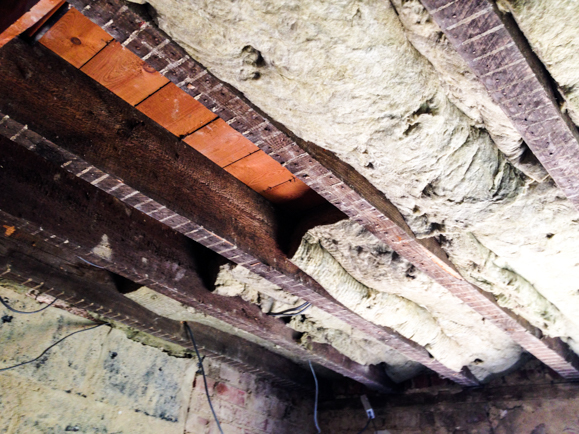 Interim inspection from building control all went well and now we can start to cover and the main structural aspects. 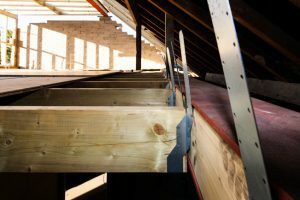 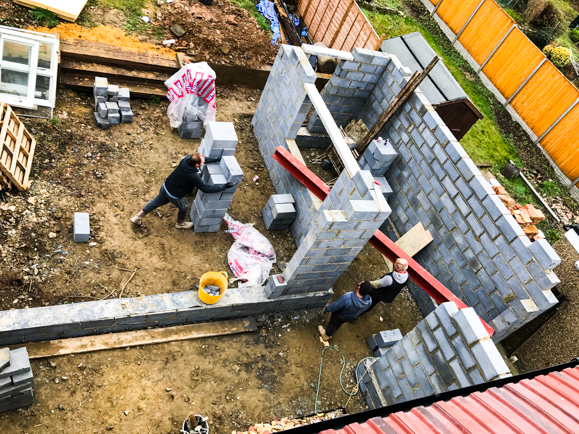 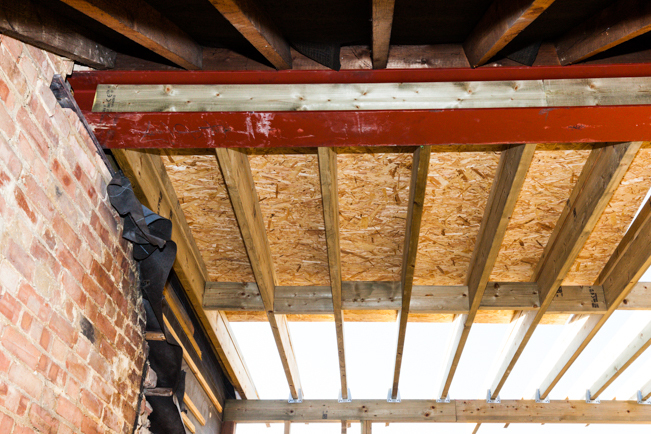 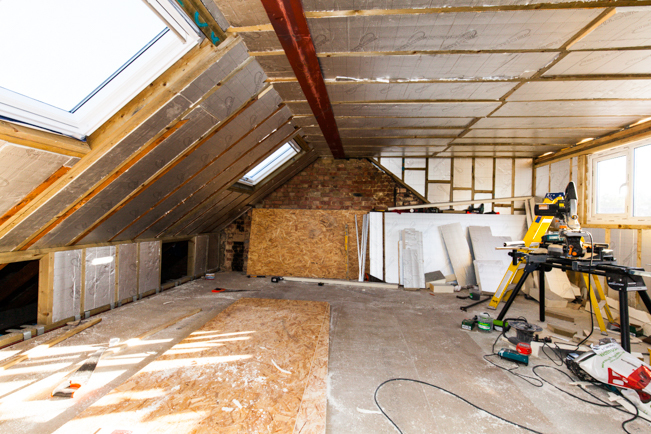 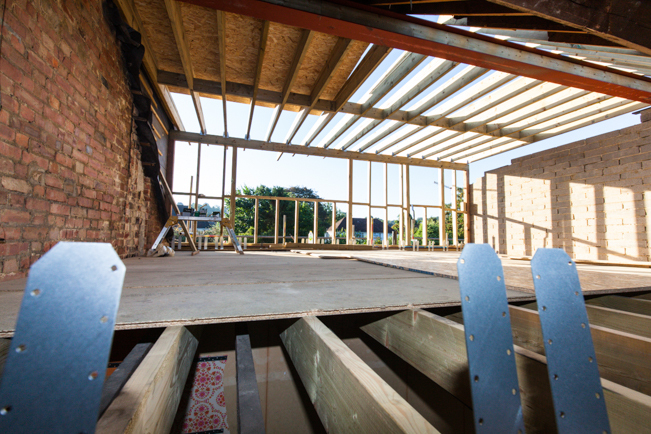 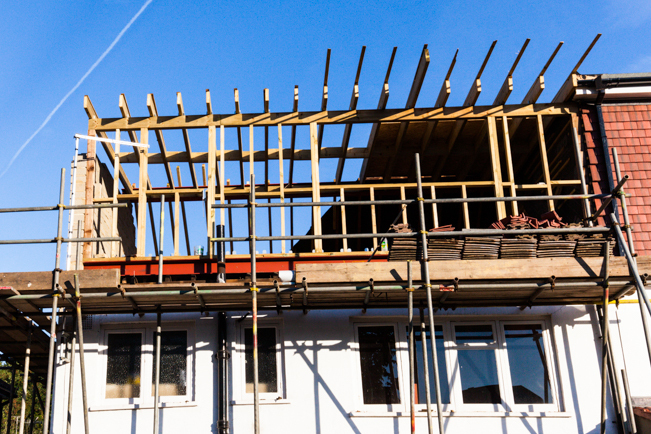 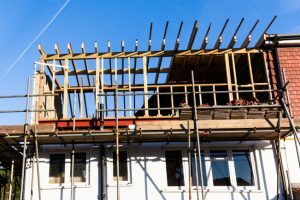 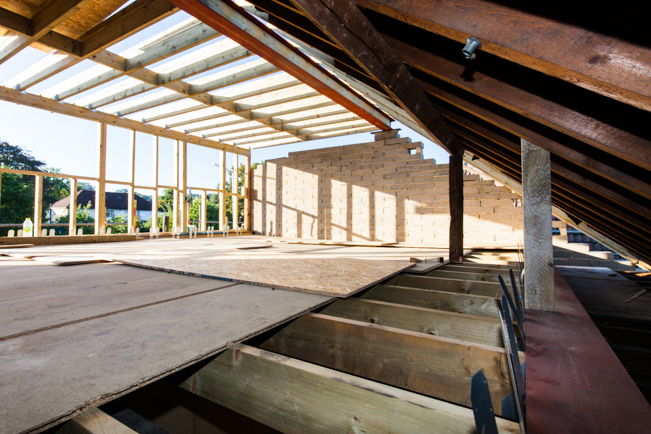 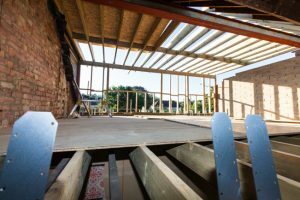 Whilst we wait for the planning appeal, the loft continues to make progress and starting to take shape, the floor joists, roof and wall structures are all in place. 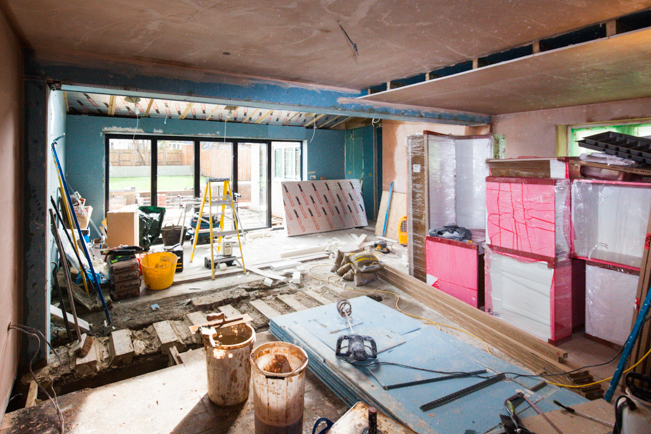 Summer holidays and the problem with the rear extension planning means that work has slowed a little, ok a lot. 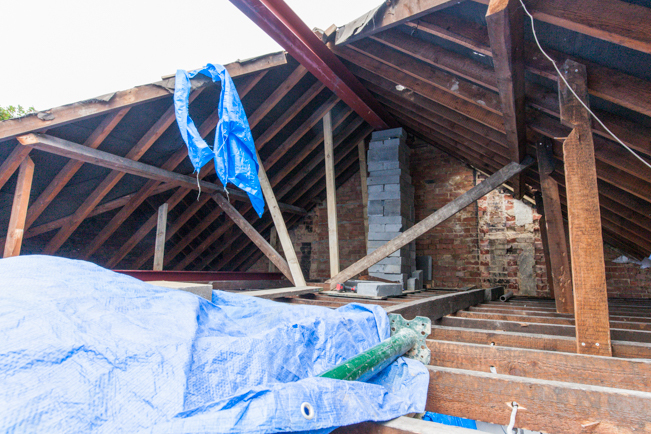 That said the boys from DBSS are still beavering away with the loft extension. I’ve been away on summer holidays for the past couple of weeks, but in my absence the loft conversion has got under way. 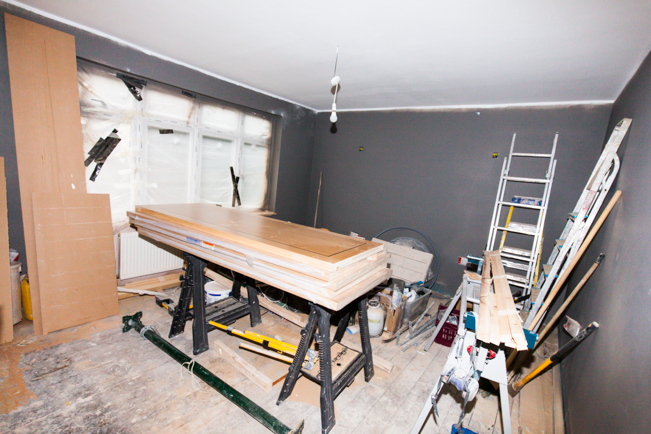 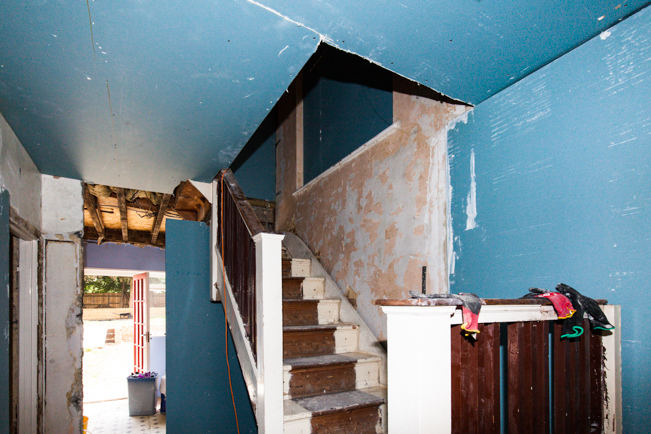 …but we have also started to put the house back together. 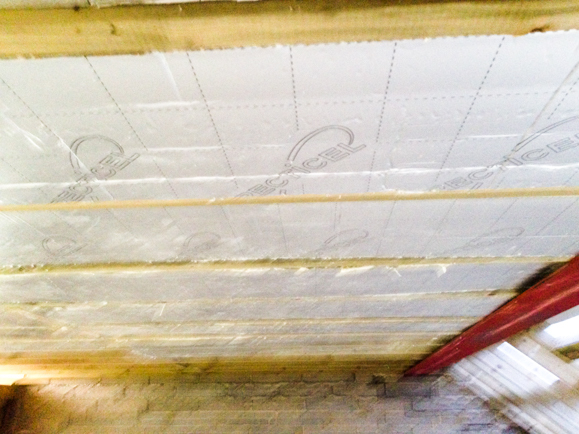 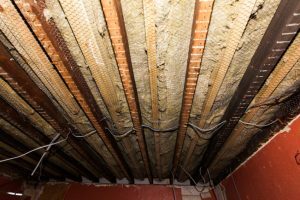 We’ve been filling the floors with Rockwool Sound Slab acoustic insulation. 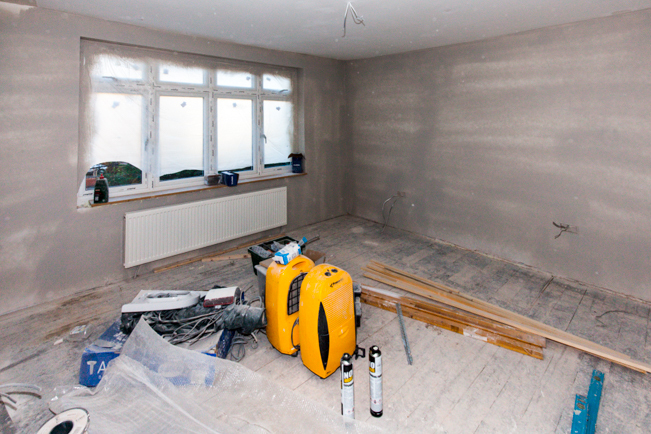 Then lining every wall and ceiling with GTEC ‘DB’ Board. This board is rated to give a 49db noise reduction, and since it is on both sides of all internal walls and ceilings the house will be super quiet inside. 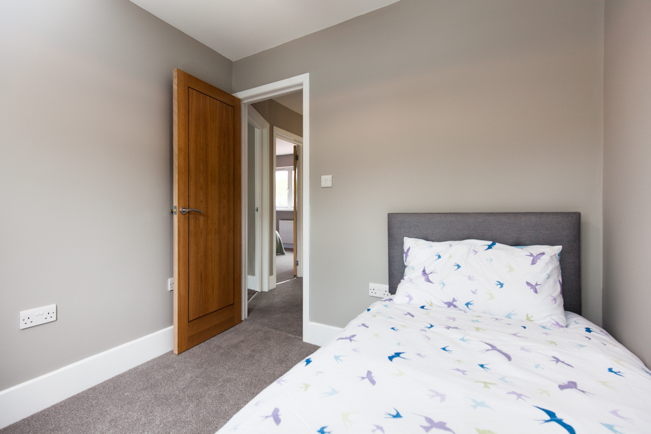 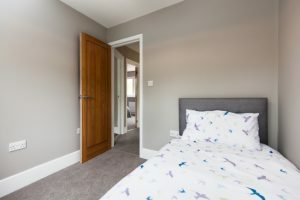 Not something we have to do as developers but we think that spending that little extra is worth it to produce a home that we are proud to put the MPC name on. 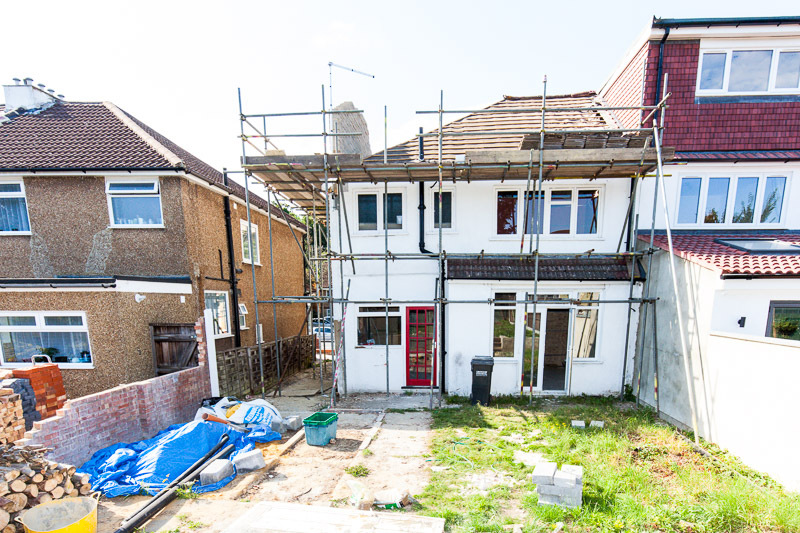 Mixed blessing from Croydon Council, the loft has been approved no problem but the rear extension has been refused. Somewhat baffeling as we have the exact same plans and designs as next door. 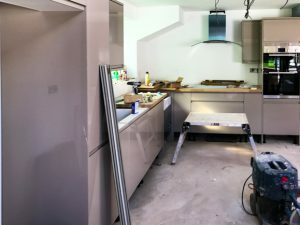 SO up to a six week delay as we appeal the decision. Sad face all round :(. Following on from the stabilisation work we’ve been busy adding supporting strapping to the house. 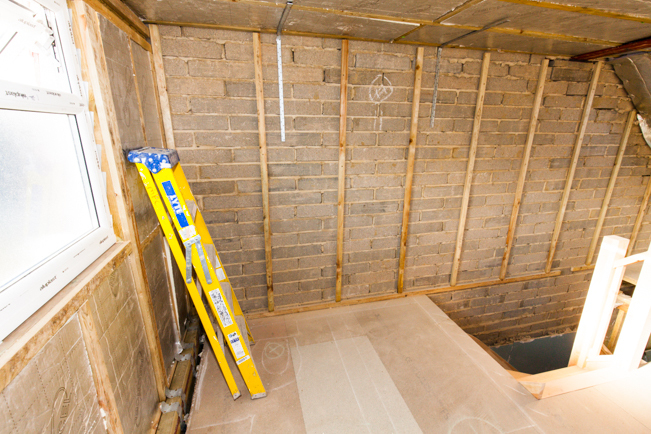 Where any wall or ceiling meets another we’ve got some strengthening straps or bars cemented into the walls as per the direction from the structural engineer. 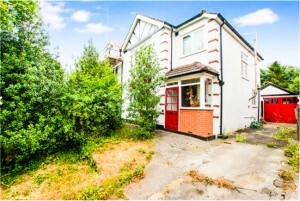 Of all the houses on this street, this one will not budge a millimeter! This week I’ve been mostly on holiday in Switzerland. It snowed at the top of the mountain and my daughter and I built a snowman! A really great week this week, as all the ground stabilisation work was carried out. 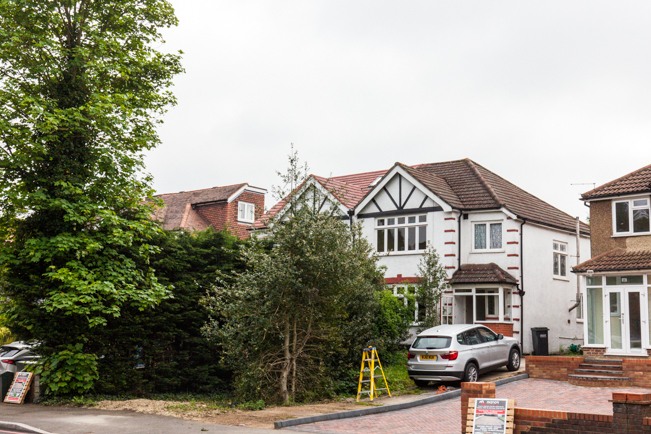 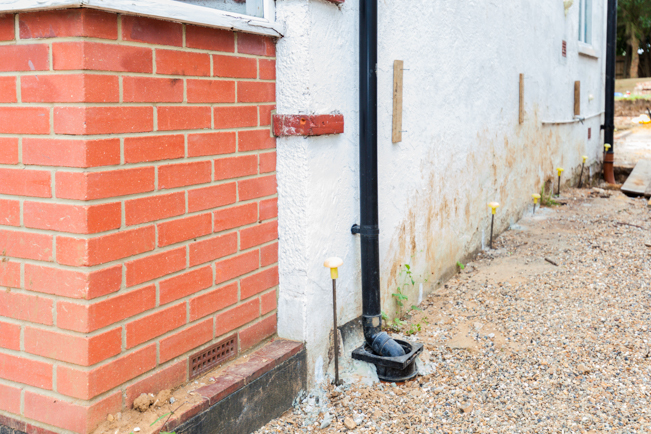 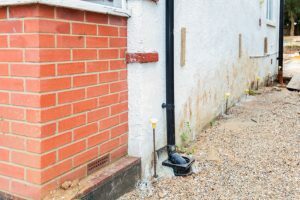 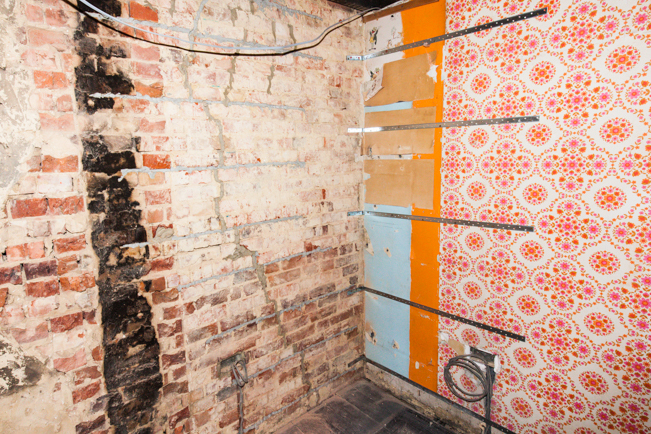 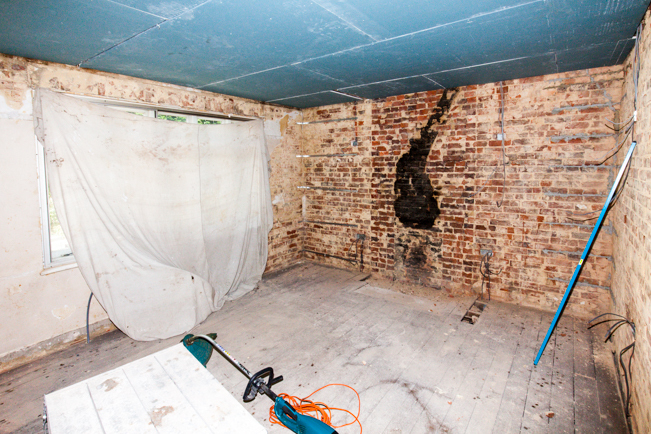 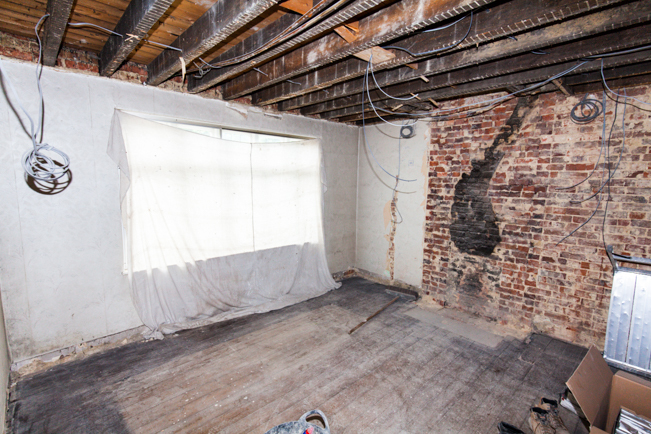 The entire party wall, front wall and driveway wall; basically every wall that we’re not going to knock down during the renovation and extension work has been treated with the Uretek ground stabalistion system to a depth of 1.5-8.2m. 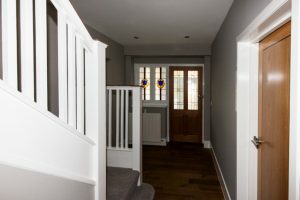 The house is now guaranteed against any movement for the next 10 years. 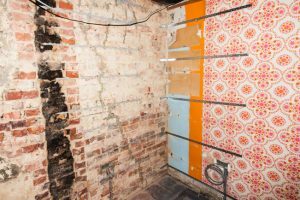 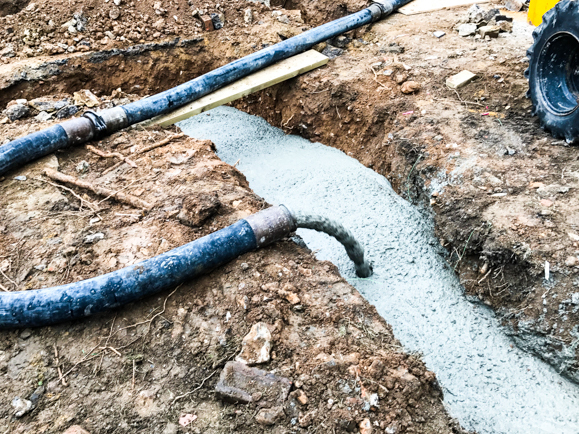 The photos show where they drilled into the foundations to pressure inject their propitiatory non-compressible foam, making the house a stable as if it was built on granite. 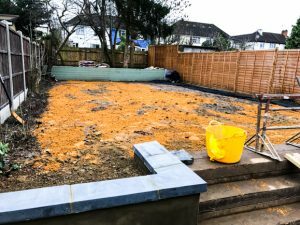 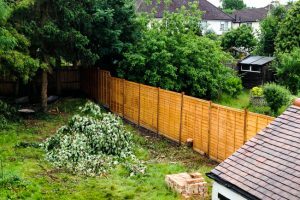 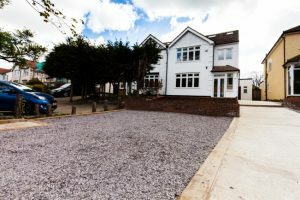 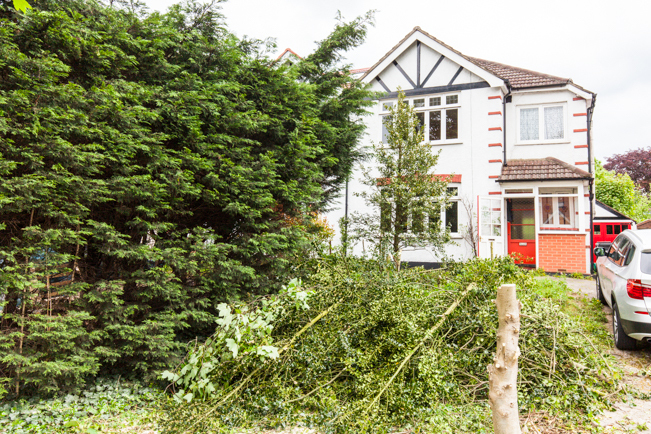 As we continue to wait for the planning permission and major structural work to be done we are continuing to concentrate on the garden landscaping. We’ve tidied the ‘wooded’ back of the garden leveling it out by making it a walled tier. 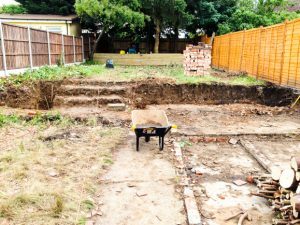 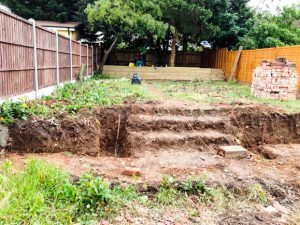 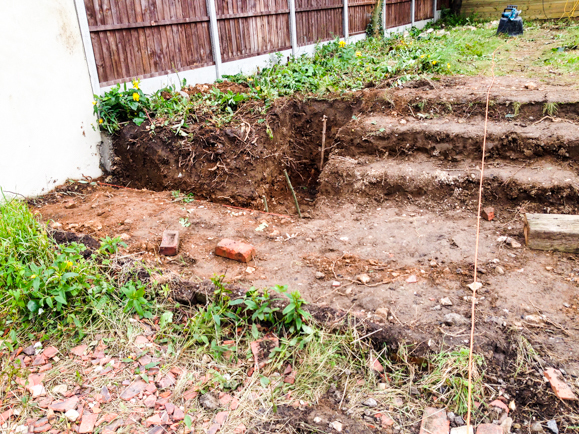 We’ve also been digging at the other end of the garden to make another tier from what will be the decked patio area up to the grassed area. 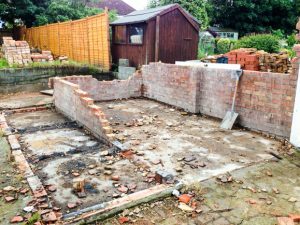 The demolition continues, the garage is all but a memory now! 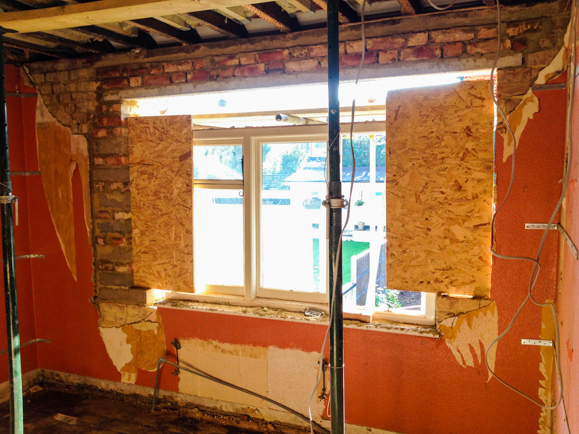 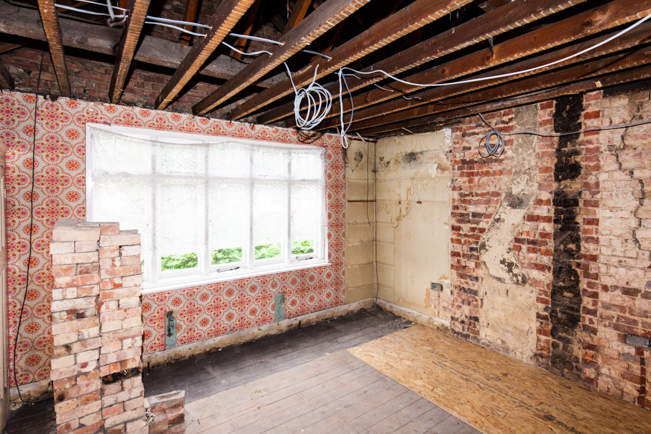 Stripping away all the old continues this week. 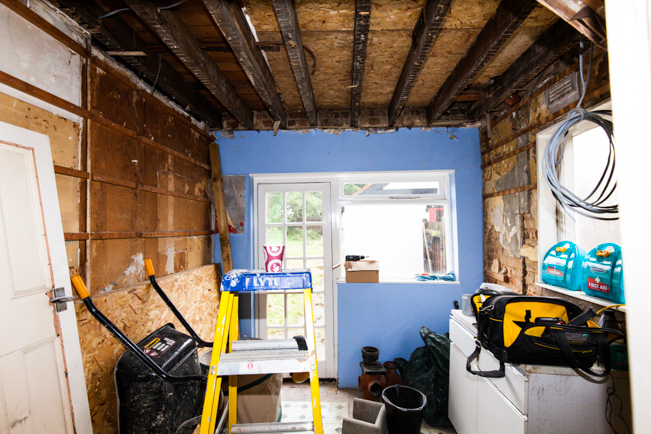 Gone are the ceilings and chimney breasts, dusty dirty work but keeps the skip well fed! 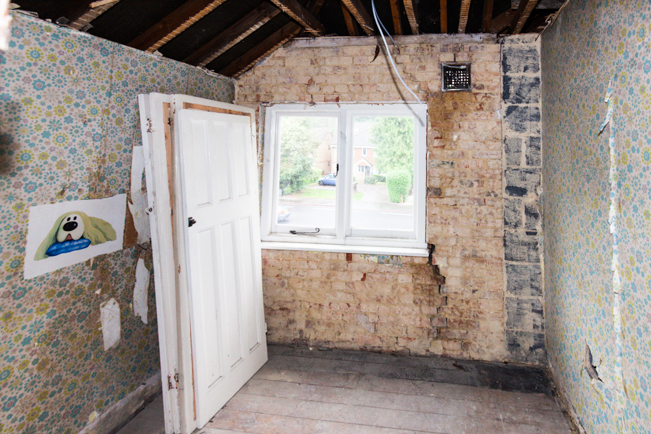 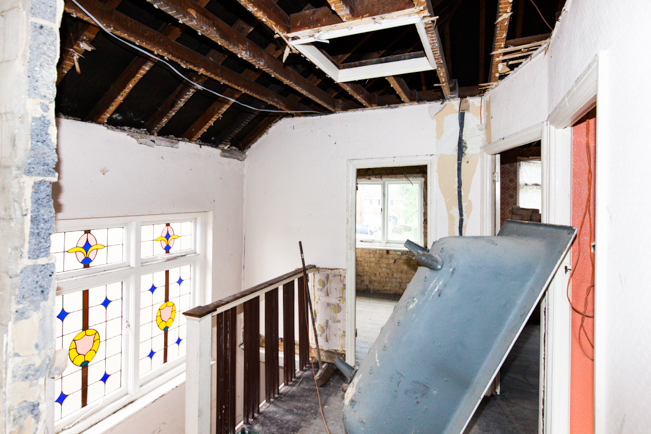 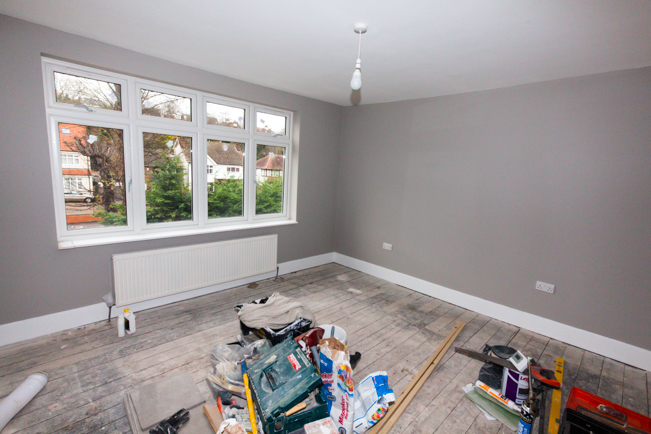 Early days but some work has started on modernising the house and putting it back together again. 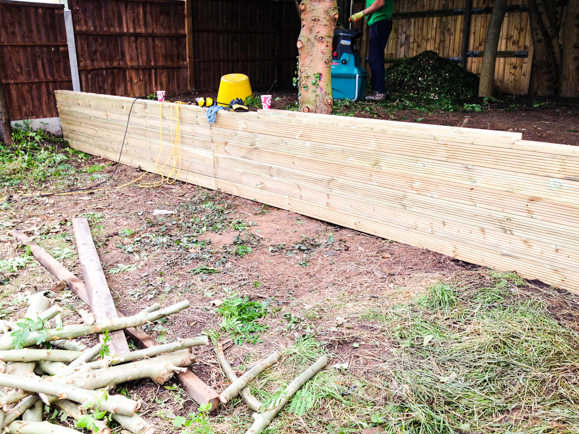 The electrics 1st fix are almost compete and we’ve got a great new fence too. 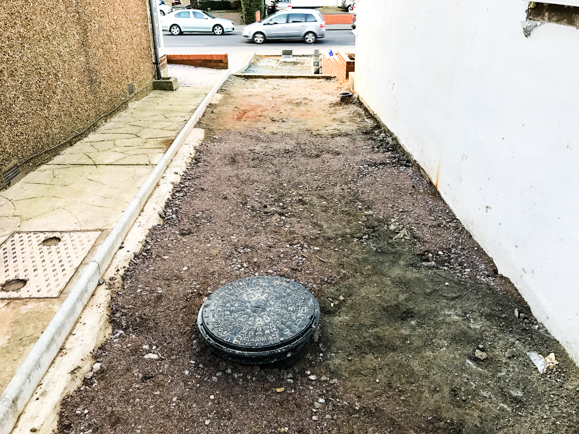 The drains were the main cause of the problems with the house, so it was an imperative that we tackled them and corrected them and stopped them continuing to damage the house. 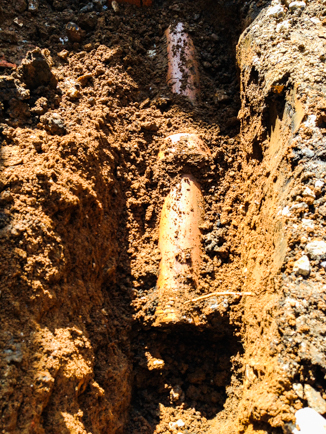 There were two main problems, the grey water from the bathroom was flowing ‘through’ this pipe. 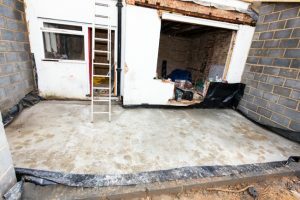 For whatever reason the joint had become totally disconnected and every time the bath emptied it just filled beneath the concrete driveway slowly eroding the soil beneath. The other problem, not so easy to see, was the main drain running along side the house. 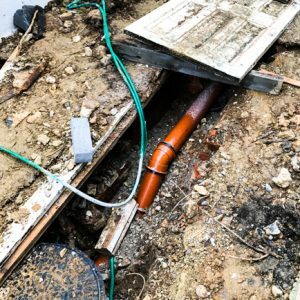 We had a drain survey, and the camera could get about half a meter before it hit a blockage. 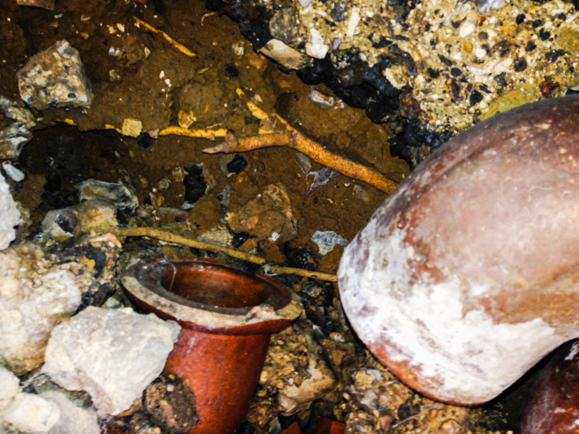 So we dug up the old clay broken pipes, which were filled solid with soil and.. erm.. badness.. The drain survey showed the pipe was unblocked from the lower manhole to about the start of the house. 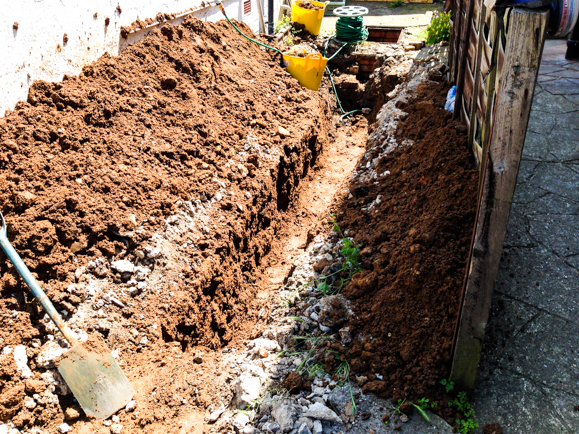 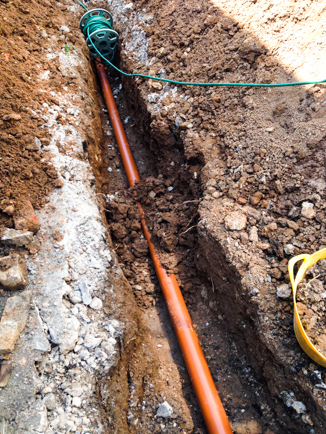 It was therefore a simple job to dig out the old pipe and replace it with a new length of uPVC pipe. 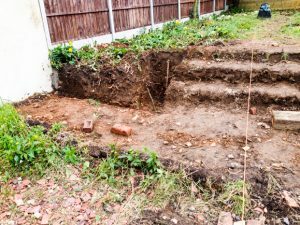 A simple task, but a full day of back breaking digging! The pleasure in fixing the drainage problem was tempered by the fact that after a day of digging, another to lay and connect pipes we had to pour two tons of gravel fill over the drain and then back fill the trench. 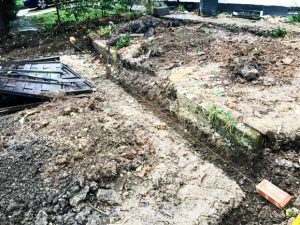 Hidden from view but good to know that everything is now flowing from and too exactly where it should after so many years of neglect. 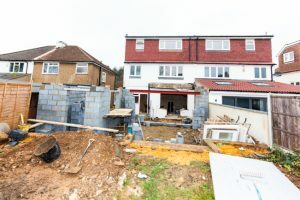 Progress remains deliberately slow as we wait on planning permission to come back and that is likely to be late in July. 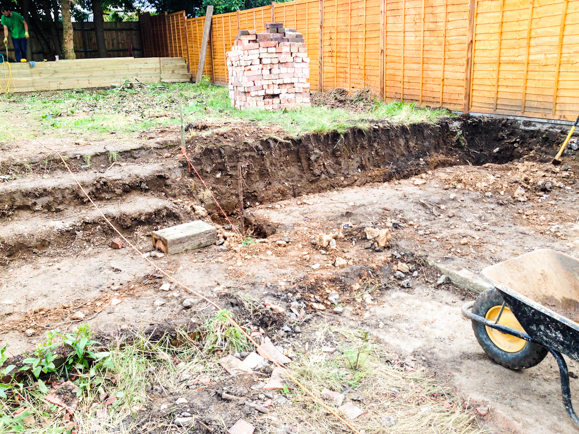 We have been making progress on the clearing out the house though. 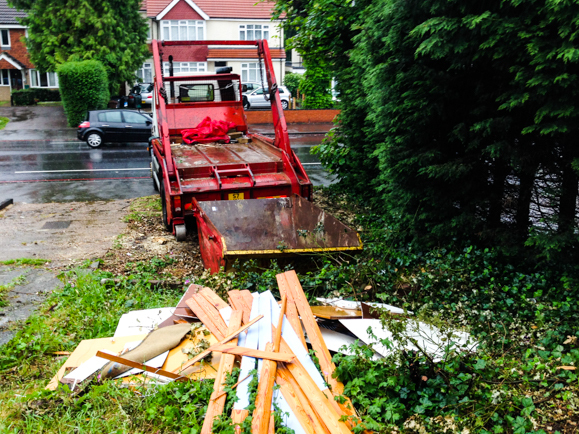 The first skip arrived and was quickly filled as was the 2nd! 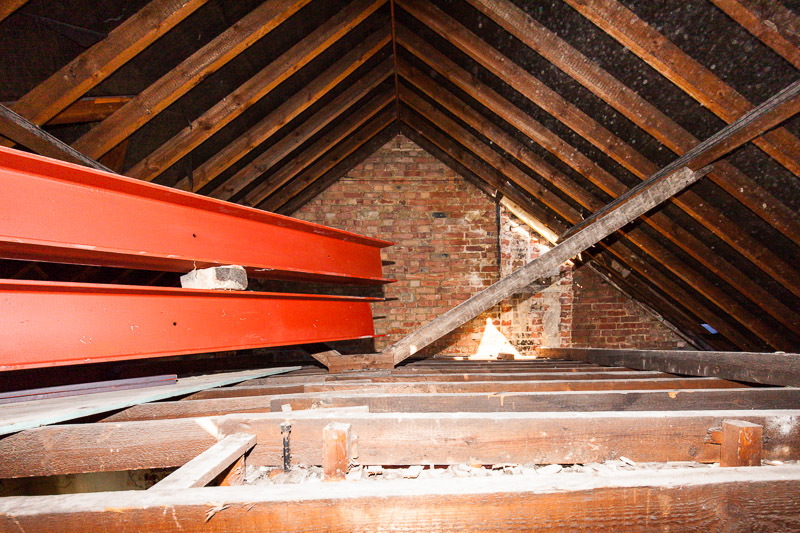 We also brought in specialist contractors to safely remove the asbestos flue. 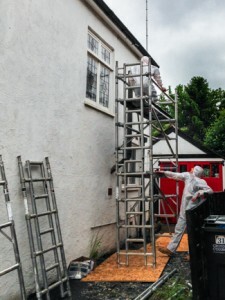 Whilst it isn’t cheap to have the asbestos removed, it is worth every penny if it is protecting your own health and I’m not sure I can carry off one of those onesies they are wearing! 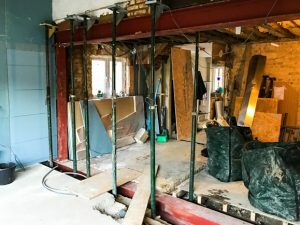 It has been a fairly gentle start, as it is more in the planning stage, not just planning permission and having plans drawn up, but organising trades. 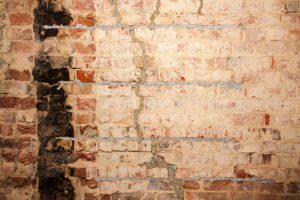 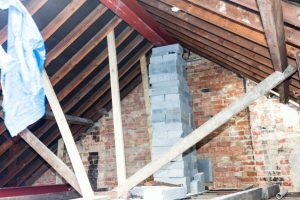 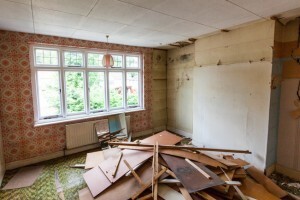 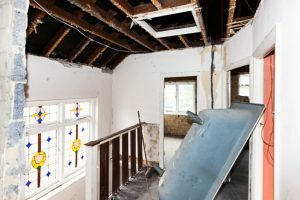 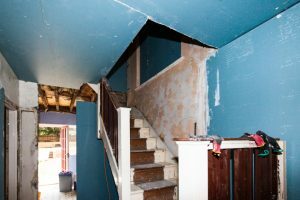 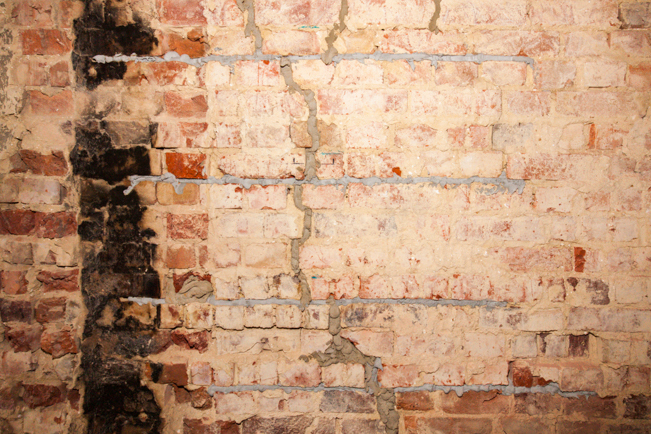 The asbestos flue for example, tracking down and getting a quote for its safe removal has been harder than it really should be. We have however been busy clearing the front garden. 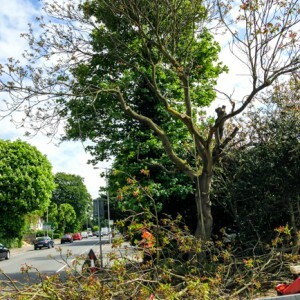 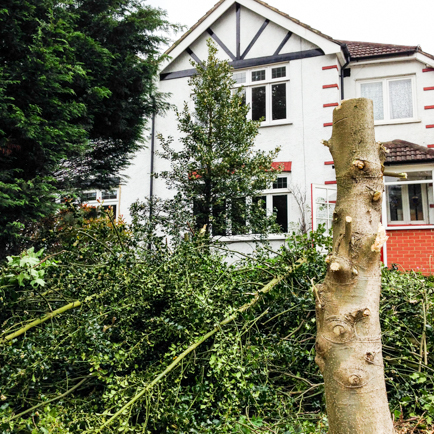 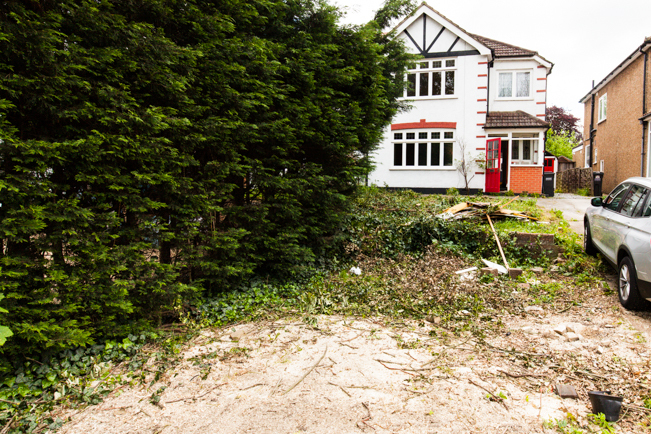 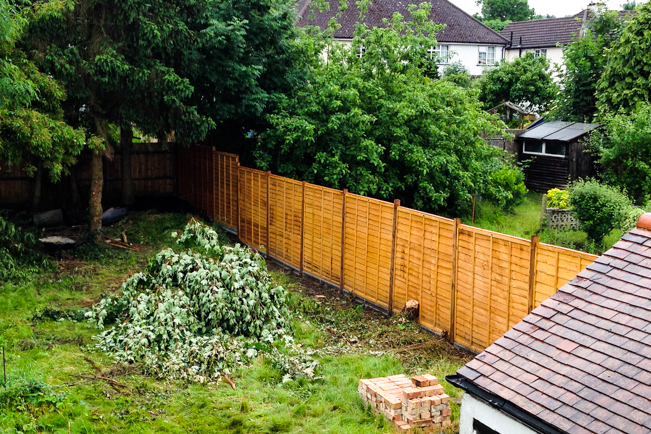 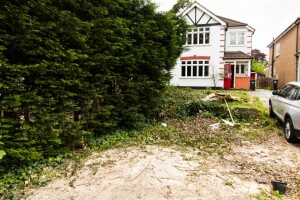 Now chopping trees down is akin to book burning, but the tree was simply too big and too close to the house not to mention being inconveniently placed right in the middle of what will be a large parking area. 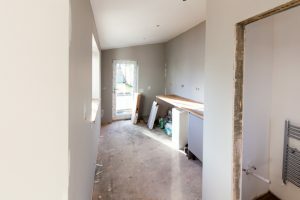 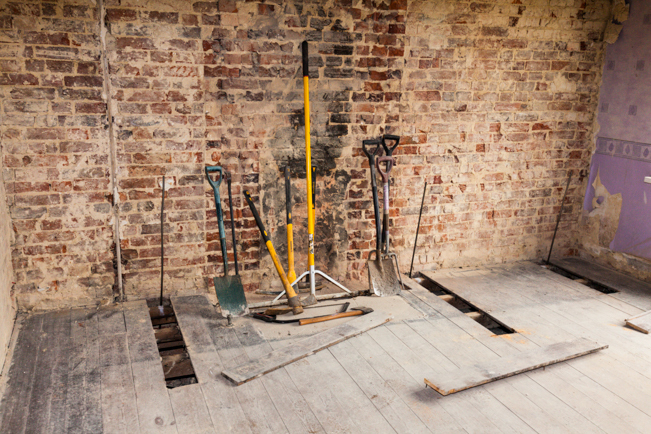 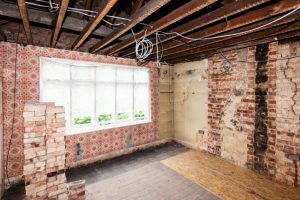 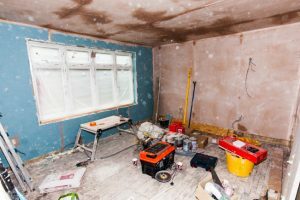 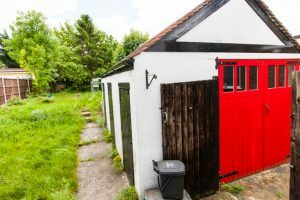 This will give us great room for all the trades, their vans and our skips too and eventually it will provide ample parking and turning for a the family we anticipate moving in. Finally completed after a lot of fuss and toing and froing with the finance company. First time we’ve needed to top up funds with financing and what a palava! 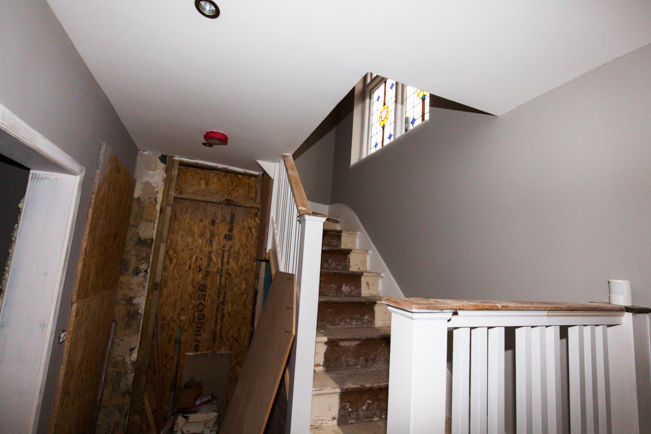 But still really pleased with the project and looking forward to getting started with it. 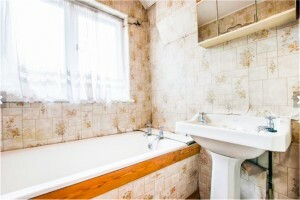 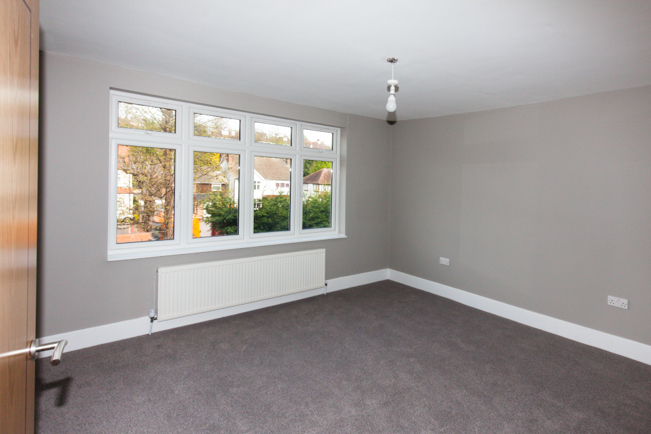 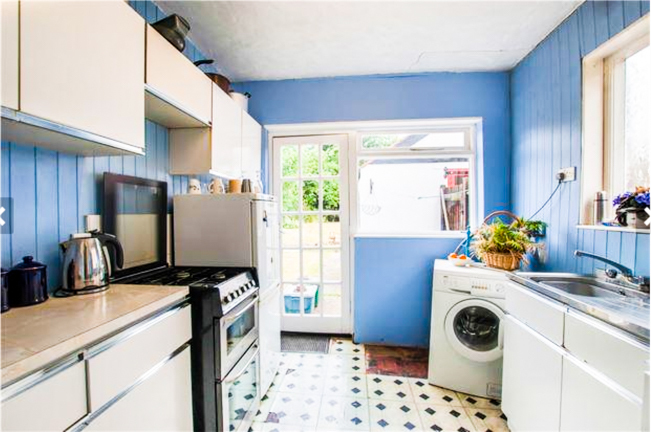 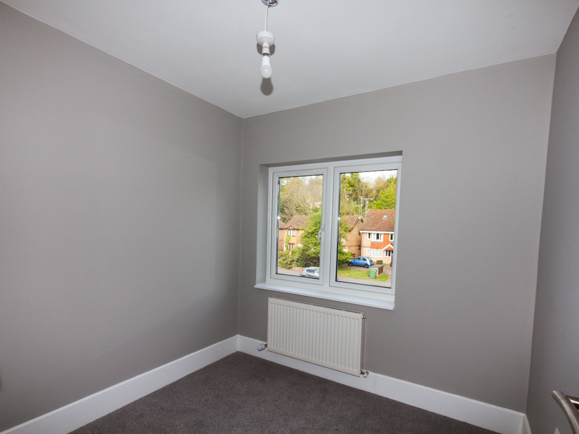 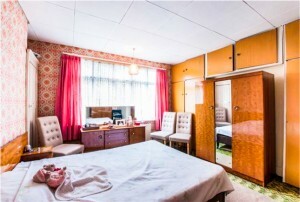 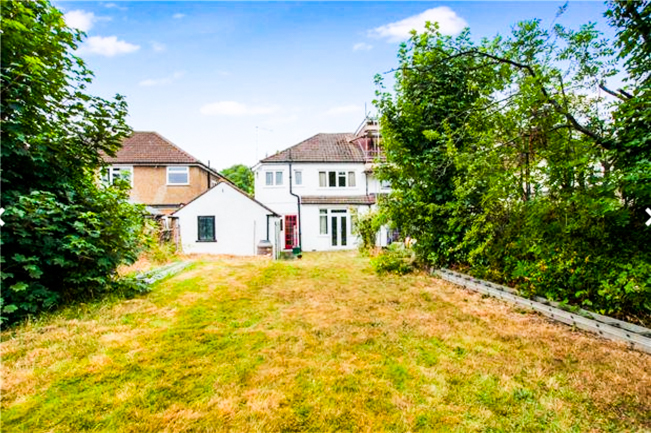 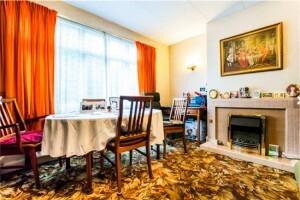 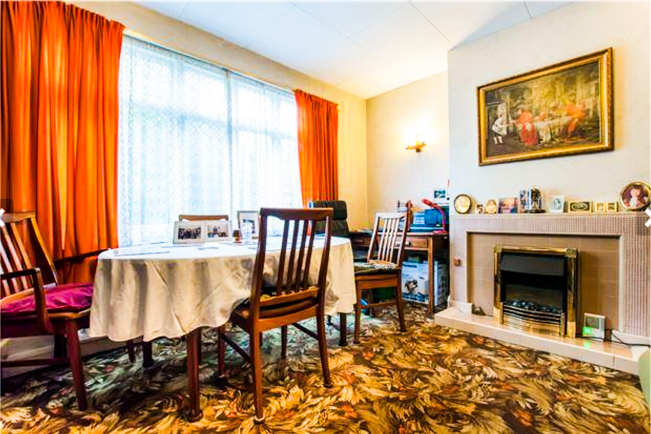 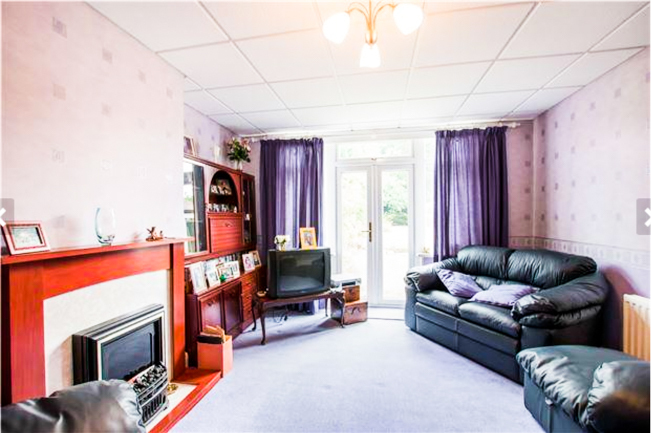 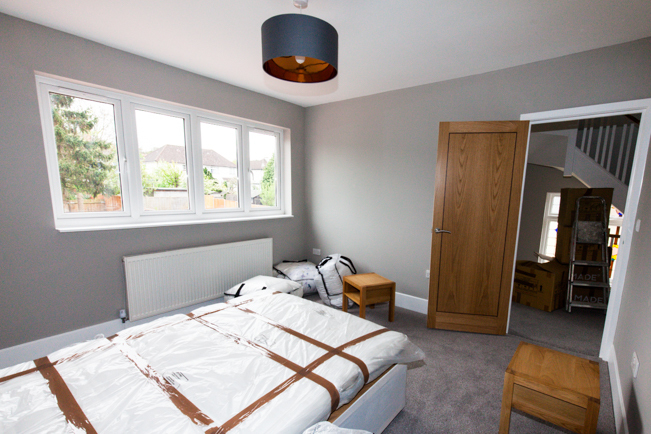 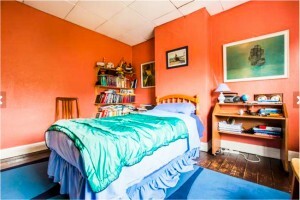 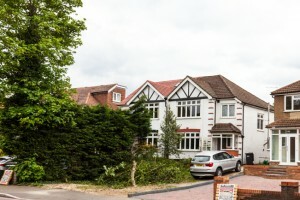 Here is a few of the estate agent photos when they must of had it for sale before deciding to put it in the auction. 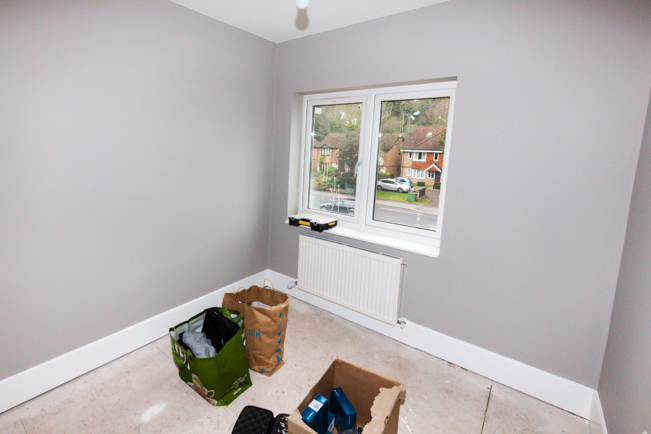 Here is a bit more of an honest non-estate agent first look, lots of work ahead!